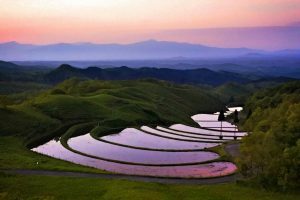 Experience the heartland of Japan in the ancient and stunning landscape of Kumamoto Prefecture, known as hi no kuni, or the “land of fire”. 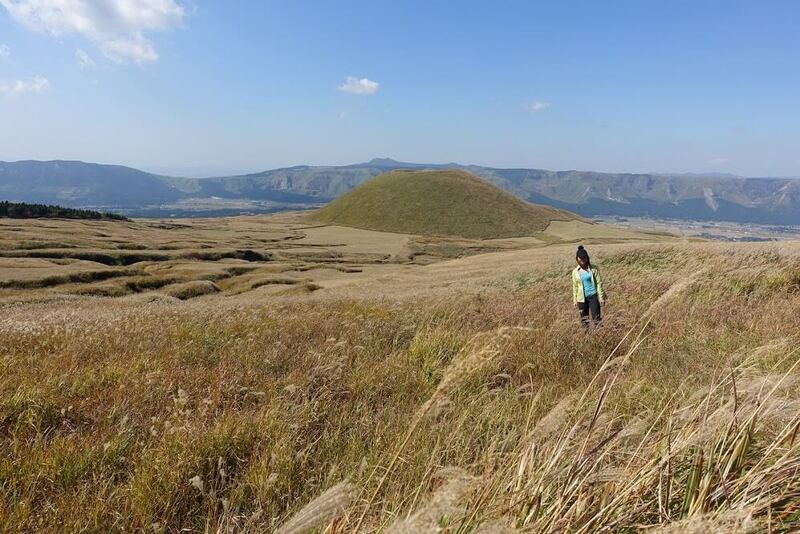 Hike Mount Aso, Japan’s most active volcano and one of the world’s largest caldera volcanoes. 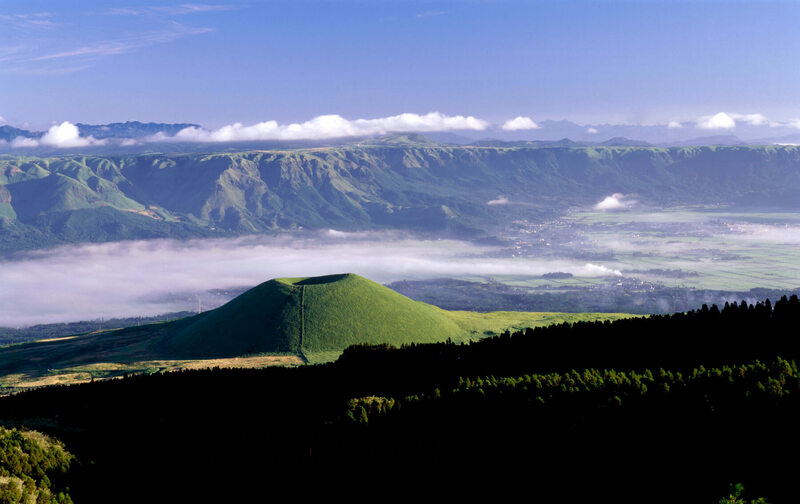 Explore scenic trails in Aso Kuju National Park and Aso Geopark, a UNESCO Global Geopark. Trek Futae-No-Touge Pass, a portion of the historic Bundo Circuit, once traversed by samurai and feudal lords of the Kumamoto Domain. Eat Kumamoto aka ushi, a variety of Japanese beef (wagyu) renowned for its rich coloring, marbling, flavor, and tenderness. 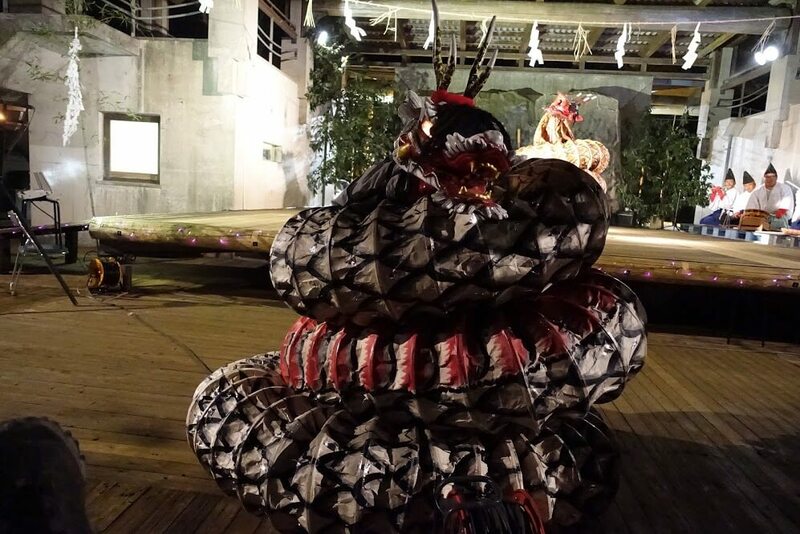 Enjoy a riveting performance of kagura, a traditional Japanese art of storytelling. 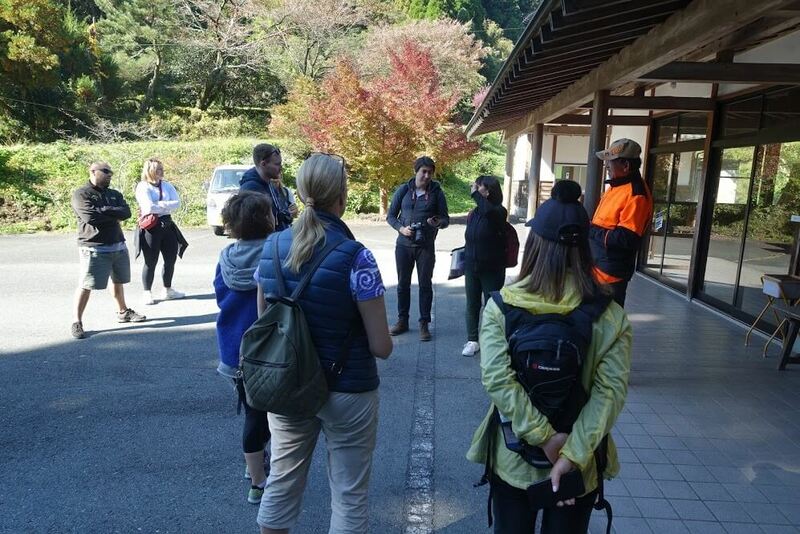 This Aso Walk Tour is a fully guided tour suitable for anyone who can walk for more than 1 to 3 hours. 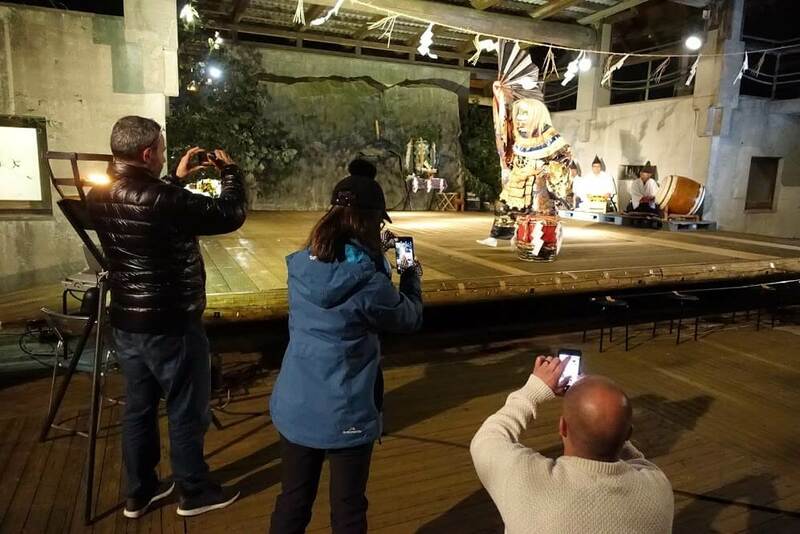 This is a 6 day, 5 night tour that will take you on the geographical highlights of Aso, a historical city in Kumamoto Prefecture, located in the region of Kyushu. 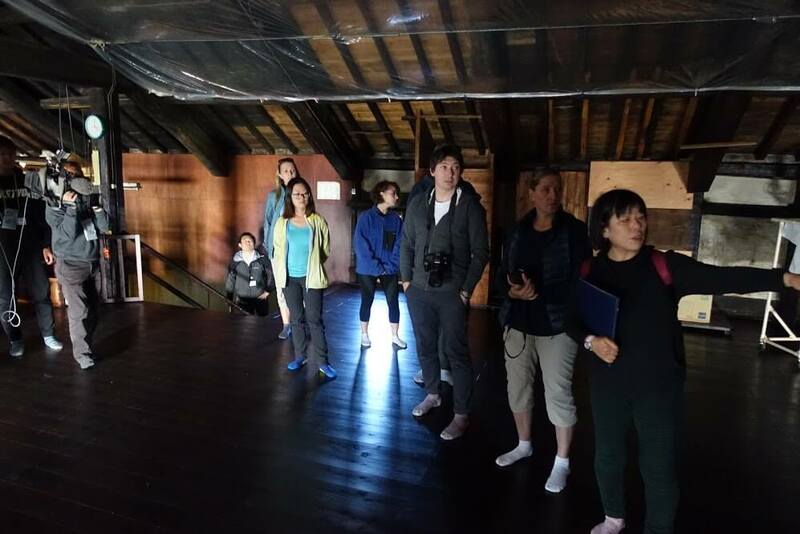 Your tour accommodation will be hotels and ryokan (traditional Japanese inns featuring tatami flooring and futon bedding). 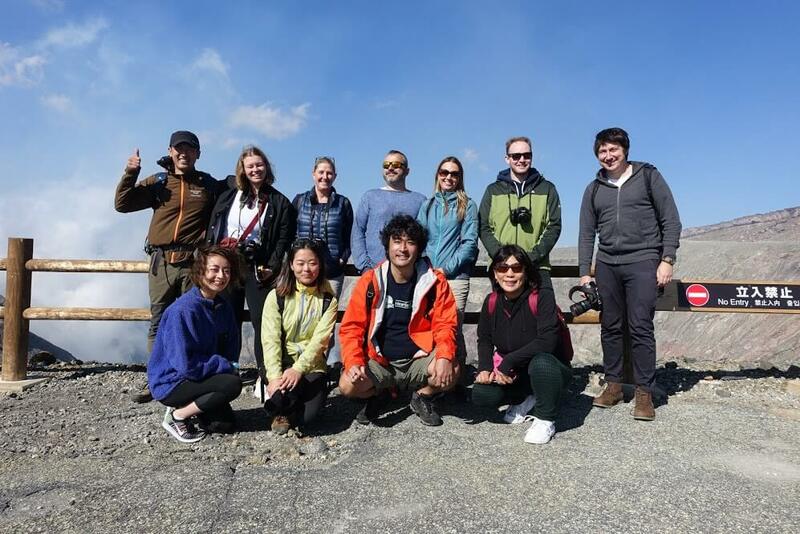 The maximum group size for this tour is 12 persons. At the heart of Japan’s most southwesterly island of Kyushu lies Kumamoto Prefecture. 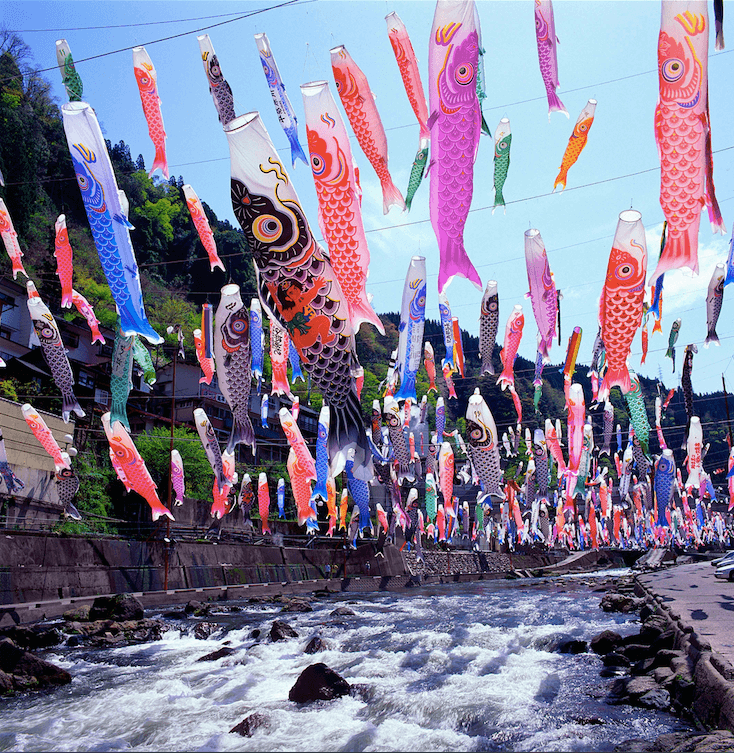 Whilst Kyushu’s modern day capital is Fukuoka, situated in the north, historically Kyushu was governed from Kumamoto. 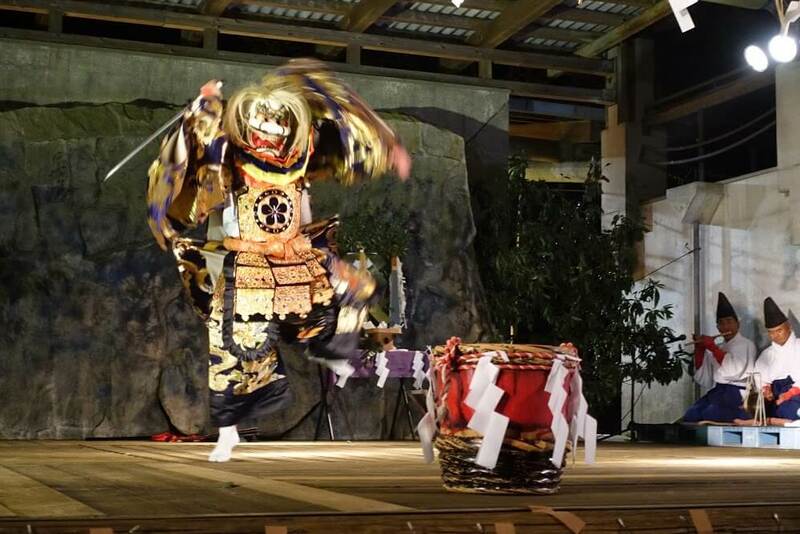 Its feudal lords presided from Kumamoto Castle, one of the top 3 revered castles in Japan. 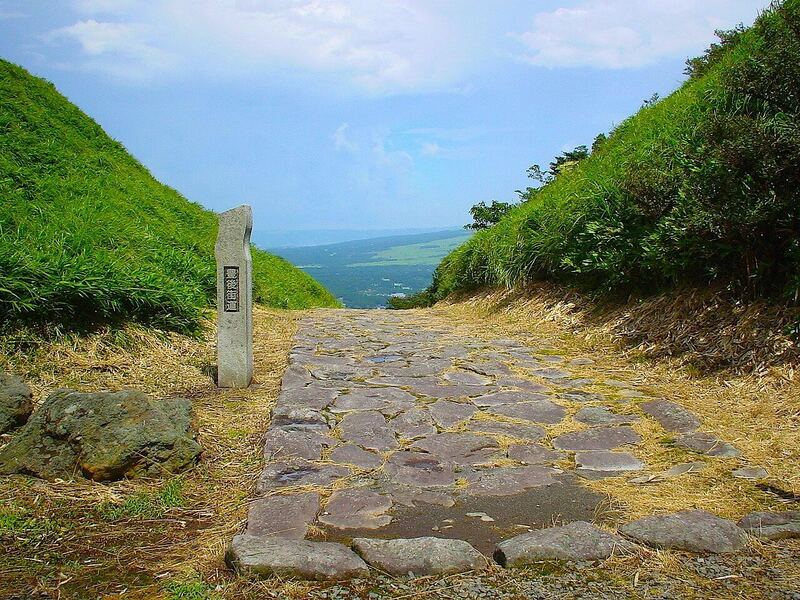 Samurai and feudal lords made frequent use of the Futaenotouge Pass, a portion of the Bundo Circuit connecting Kumamoto to Tokyo. 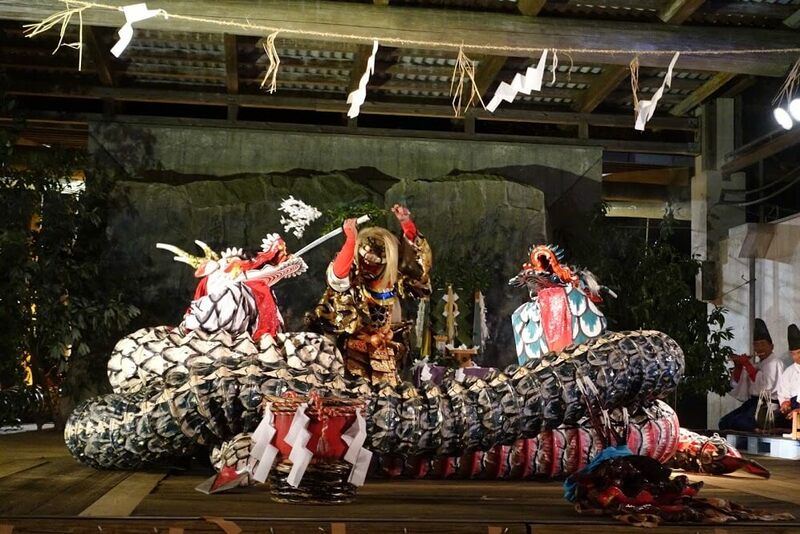 Kyushu’s historical importance stretches back beyond the days of samurai. 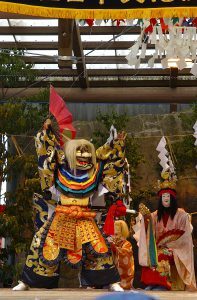 Kagura (“entertainment for the gods”), a traditional form of performance art, is said to be based on an episode in Japanese mythology in which the sun goddess Amaterasu retreated to a cave, depriving Earth of sunlight. 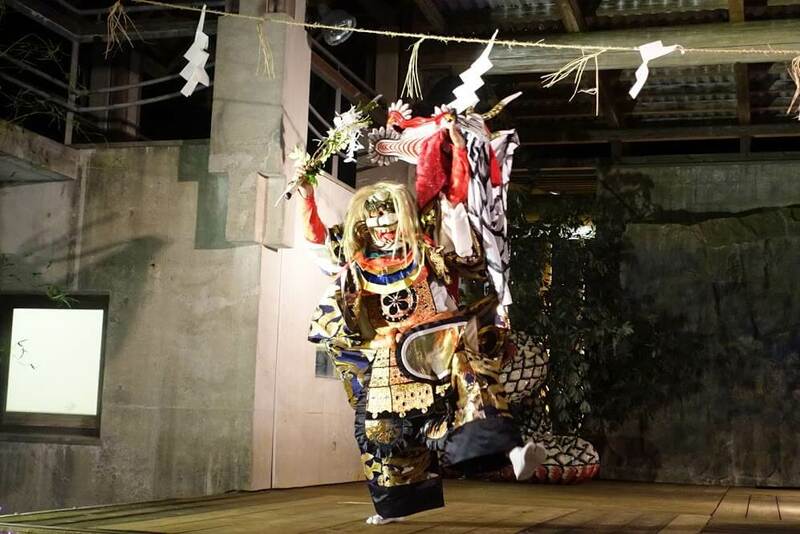 The other gods enticed Amaterasu to emerge by dancing outside of her cave until she could no longer contain herself. This cave is known as Ama no iwato, “the cave of the sun goddess,” and is located across the border of Kumamoto Prefecture, in neighboring Miyazaki Prefecture. 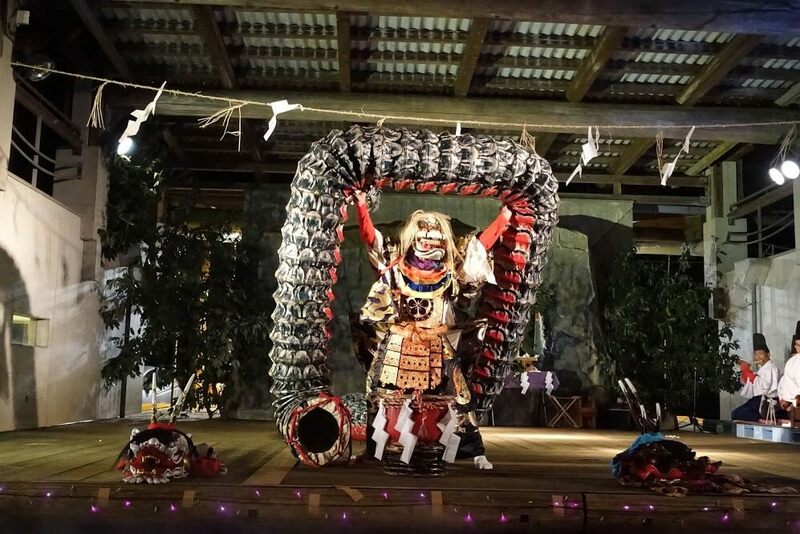 There will be an opportunity to enjoy a performance of kagura in Namino, a village in the northeast of Kumamoto Prefecture enveloped by mountains and rich in natural resources. 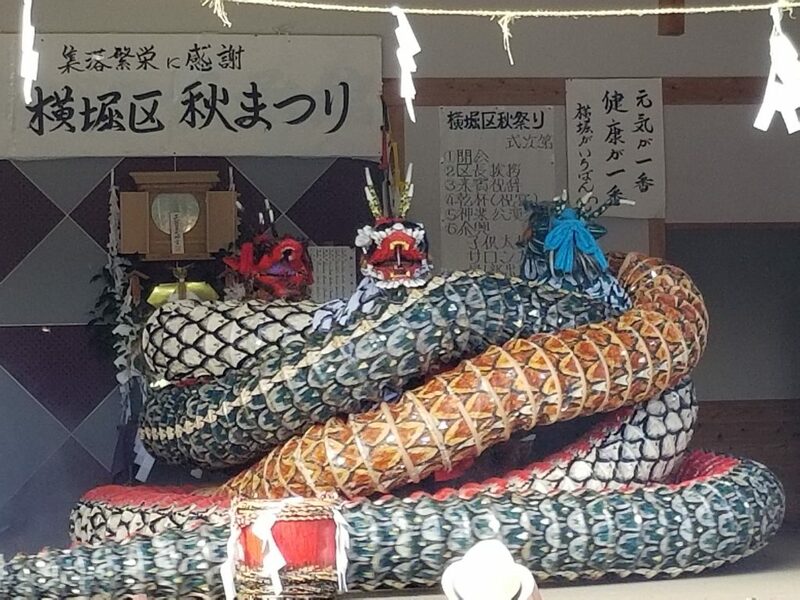 Given that the origins of kagura can be traced back to Ama no iwato, it is hardly surprising that Aso is home to Shinto shrines that venerate the Japanese Gods (kami). 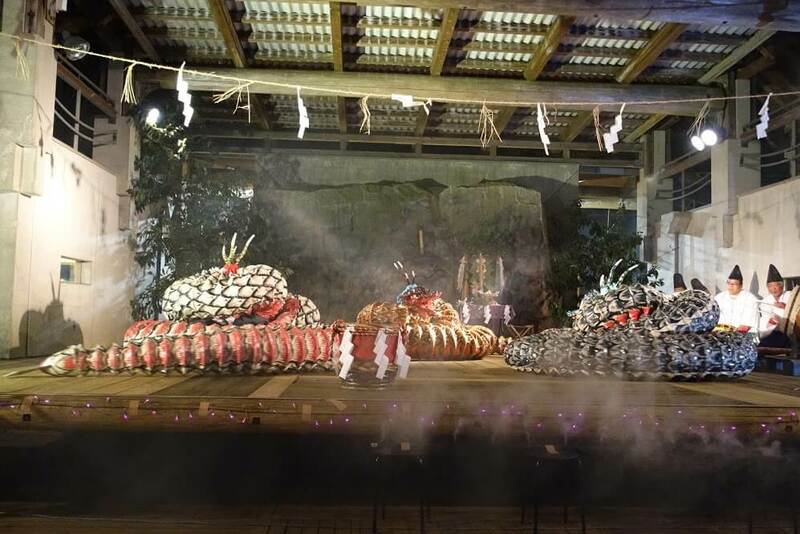 The oldest Shinto shrine in Kumamoto Prefecture is Kokuzo Shrine. 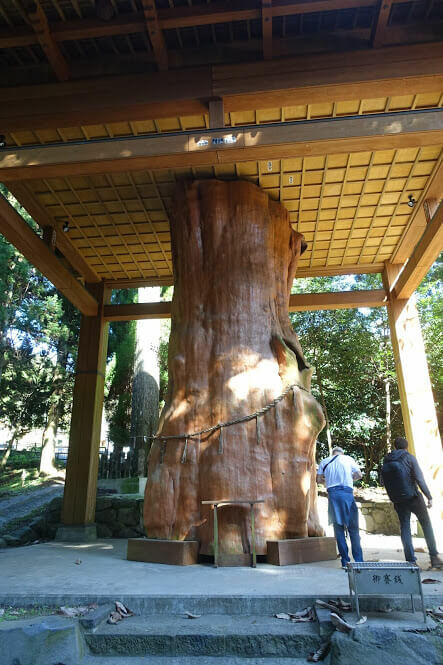 On its grounds is a massive cedar tree said to be planted by the pioneer god of Aso, Hayamikatamanomikoto. 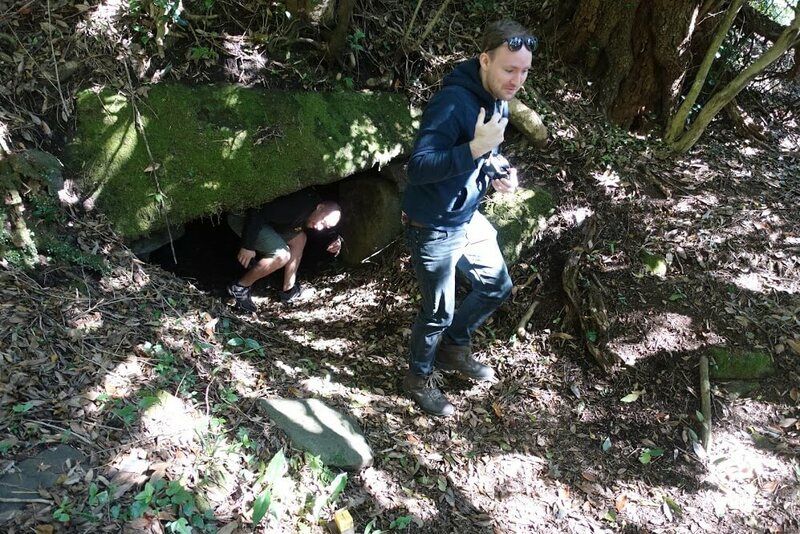 Near Kokuzo Shrine are the 6th century kofuns (megalithic tombs comprised of horizontal hole-shaped stone chambers) of Kami-Mikura and Shimo-Mikura. 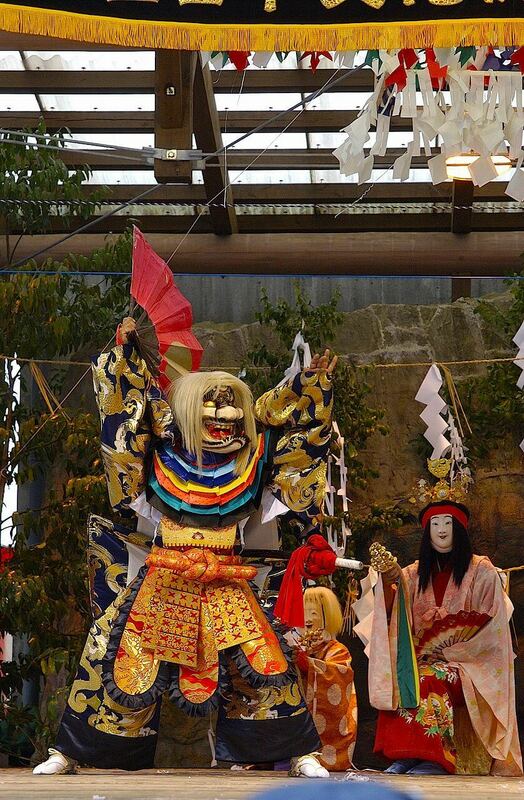 Here another deity, Konpira, of thunder, water, and agriculture is enshrined. 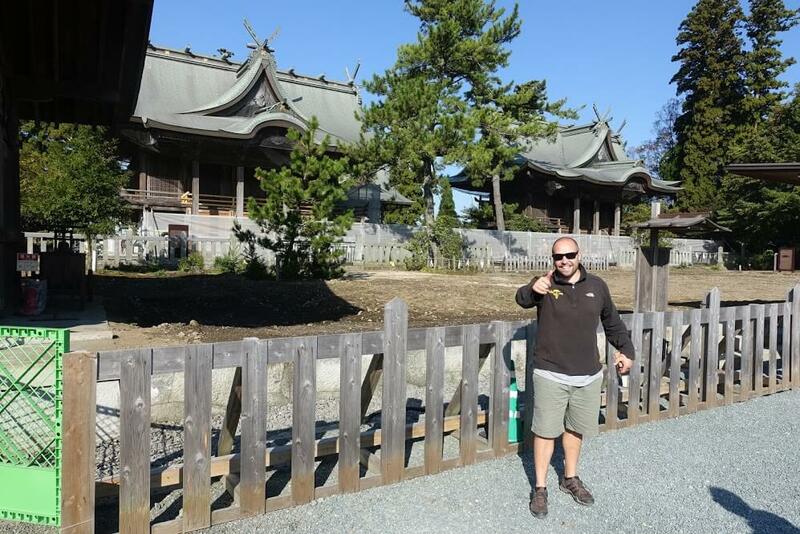 Horai Yoshimi Shrine is distinguished by its 700 year old towering twin cedars. 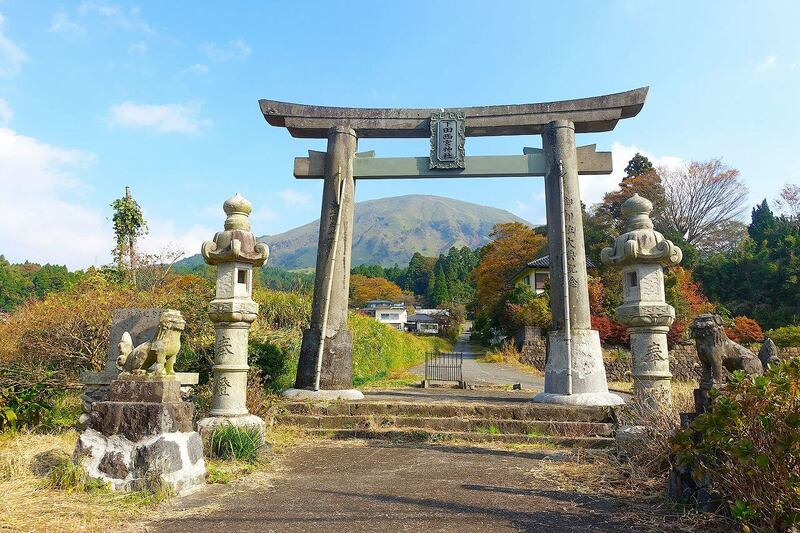 Aso Shrine is one of the oldest shrines in Japan, dating back to the 3rd century. Its spectacular two-story Romon Gate was the largest in Kyushu, and was one of Japan’s three largest shrine gates. 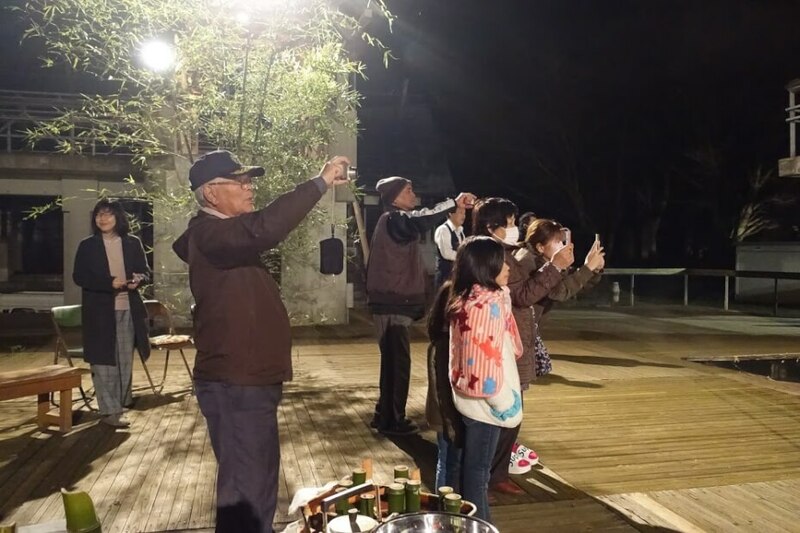 The spring water located near Aso Shrine is celebrated as a gift from the gods. 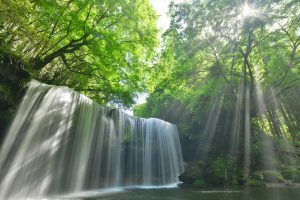 Other prized sources of water are Nabegataki Falls, with a 20 meter (65 feet) wide curtain of cascading water, Teno no Meisui, believed to the secret to longevity, and Ikeyama Fountainhead, chosen by the Japanese Environment Agency as one of the 100 exquisite and well-maintained waters in Japan. There will be ample time to explore the abundant nature of Aso on this tour. 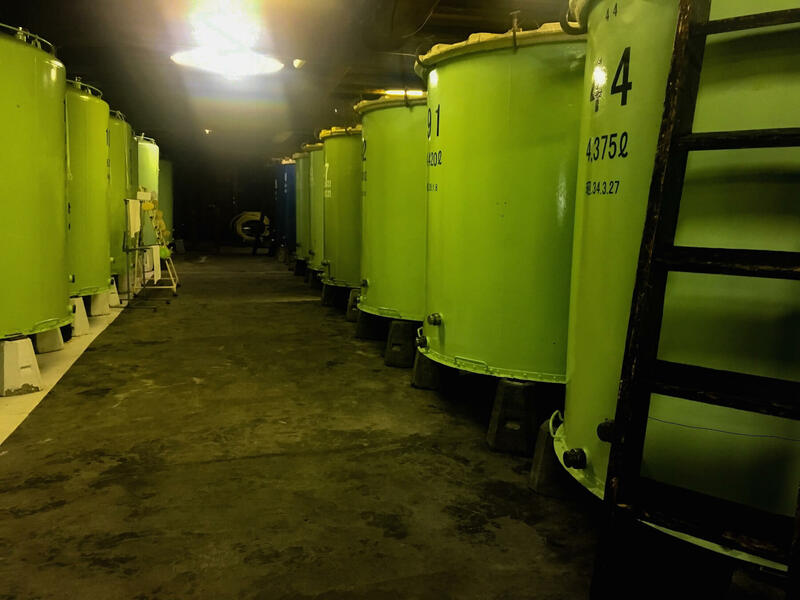 In addition to pure and fresh water, Aso is home to several major. 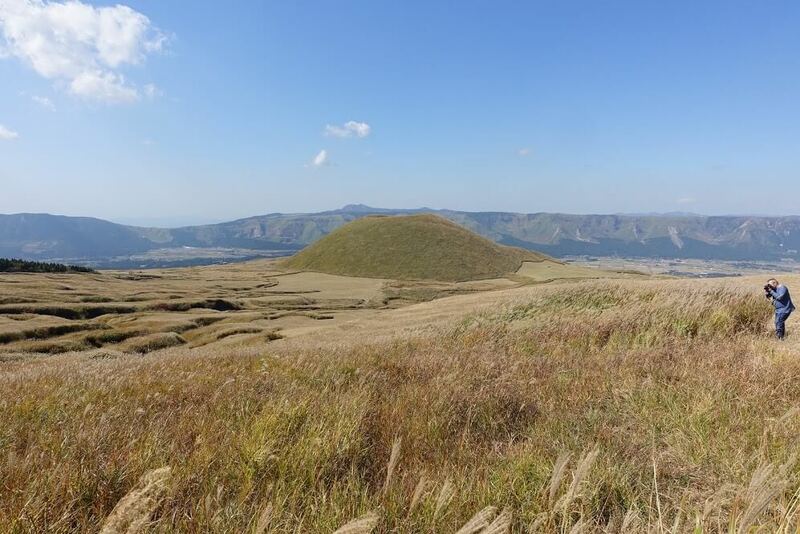 Aso Kuju National Park, and the UNESCO designated Aso Geopark feature dynamic landscapes that exhibit the best of Kumamoto’s natural beauty, while Higotai Park offers serene views of the Aso highlands. 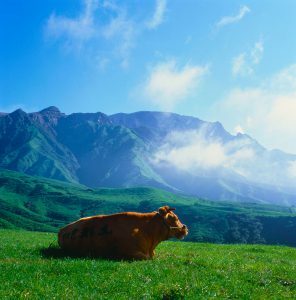 Another feature of Aso highlands are gyudou, the trails made by cattle crisscrossing the hills and mountains as they graze. 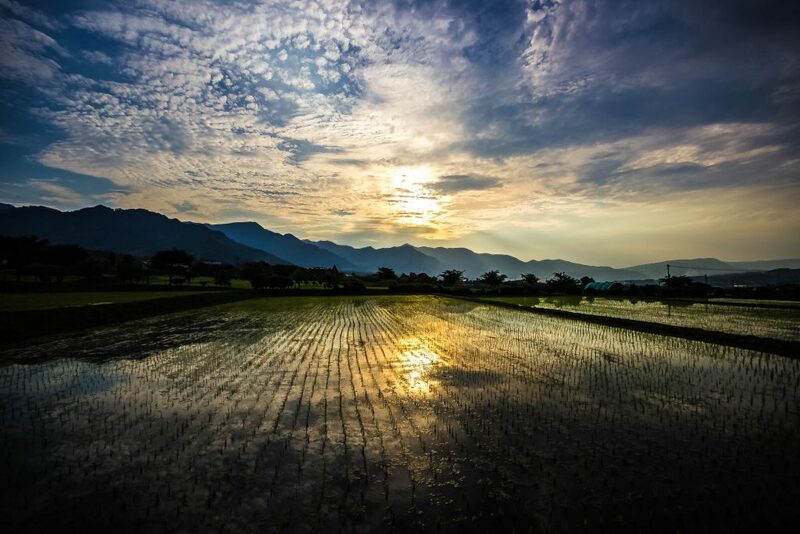 Not to be overlooked however, is Ougida rice terrace, selected as one of the Top 100 Terraced Paddy Fields in Japan. 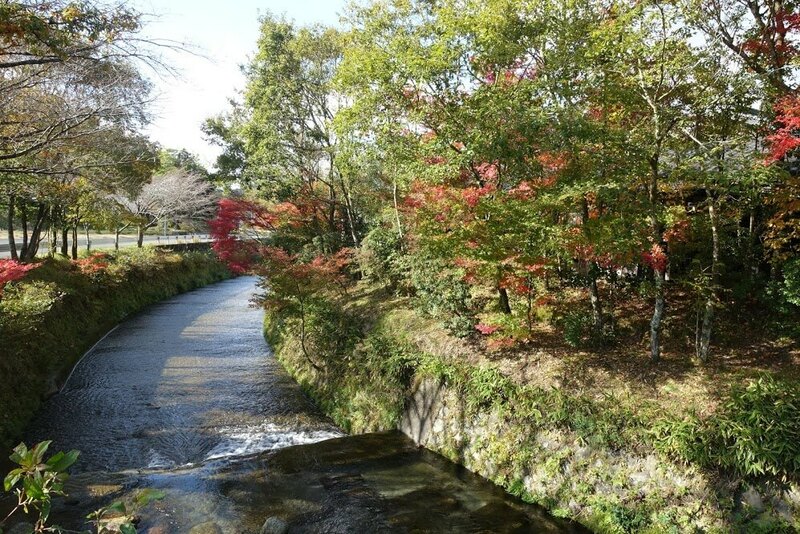 On the surface, Aso is a place of tranquil beauty. 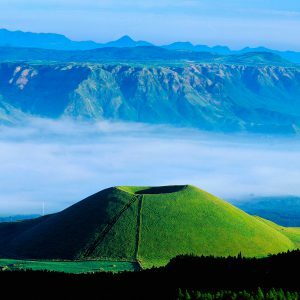 Charming villages like Minami Aso, Takamori, and Ubuyama offer breathtaking views of Mount Aso and its 5 peaks. 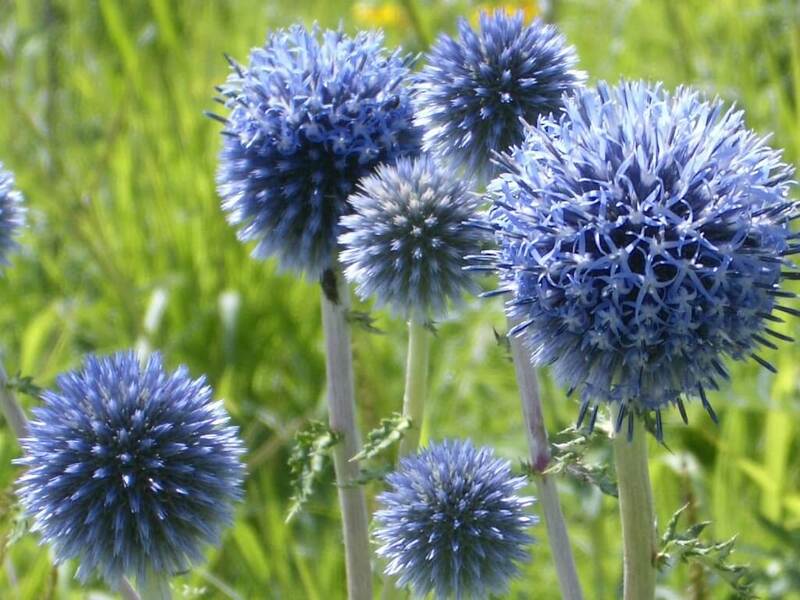 Yet underneath the beauty is a volatile force that cannot be tamed. Central Kyushu is dotted with volcanic mountains, and Kumamoto Prefecture is frequently referred to as the “land of fire” (hi no kuni), a term referring to the prefecture’s volcanic activity. 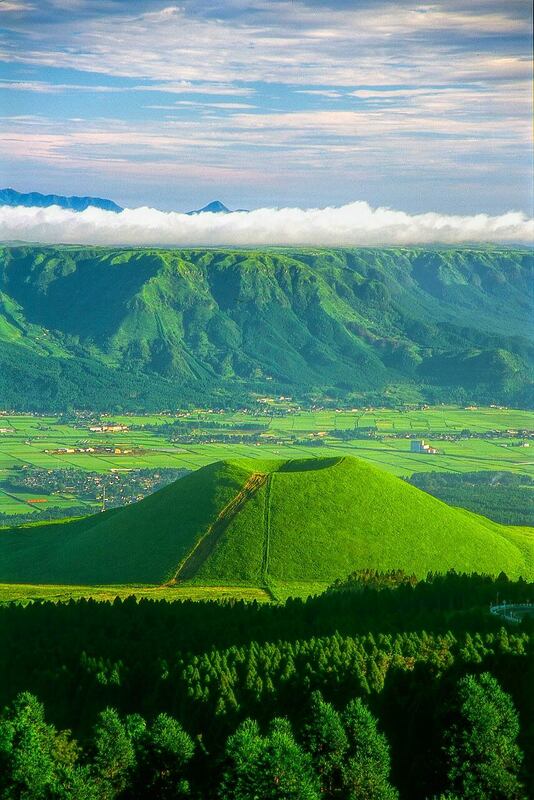 In fact, Kumamoto is home to Mount Aso, Japan’s most active volcano and one the world’s largest caldera volcanoes. 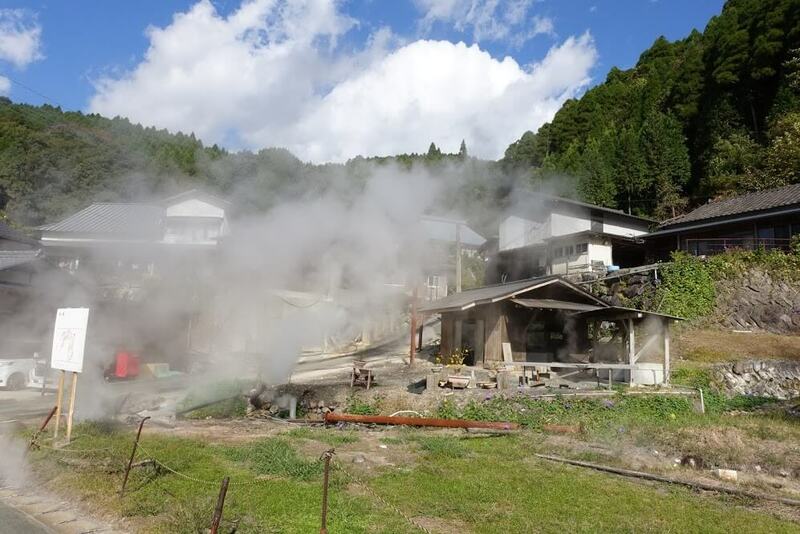 Due to the volcanic nature of the prefecture, Japanese hot springs, or onsen, are abundant. 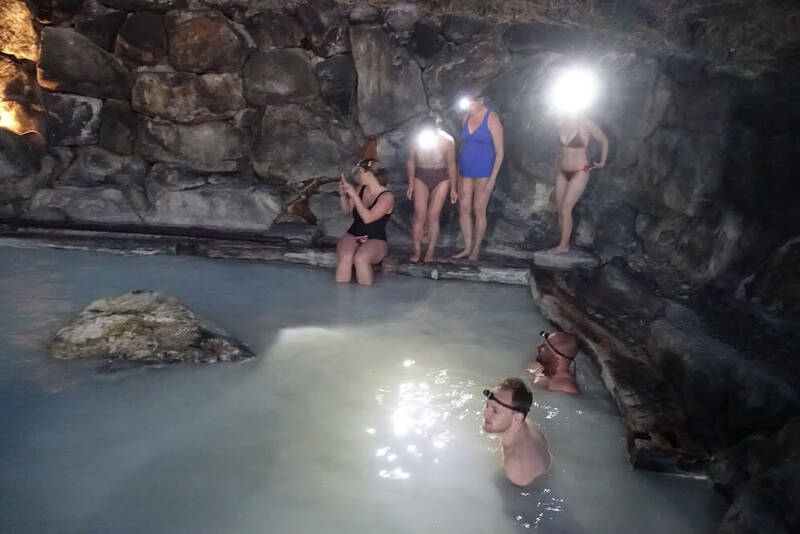 Several of which will be visited on this tour, including Waita Onsen village, a collection of six hot springs located at the base of Mount Waita. 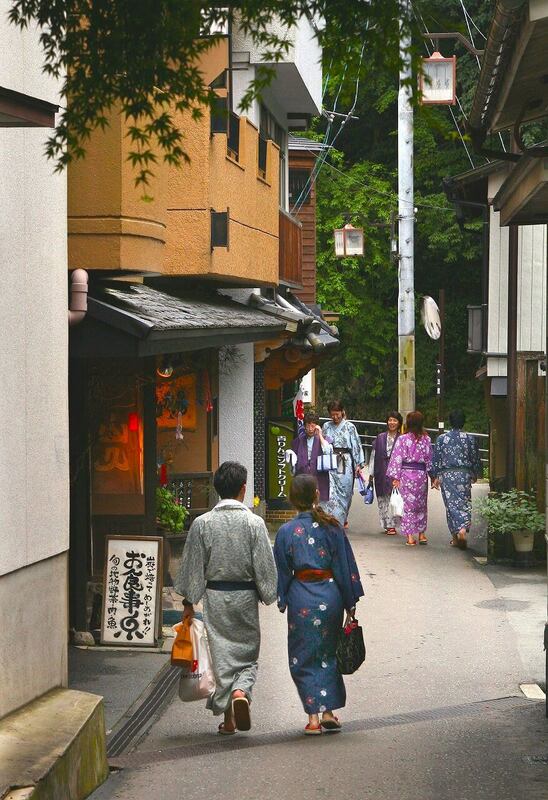 Additionally we will visit Japan’s hidden gem of Kurokawa, a picturesque onsen town north of Aso. Another notable onsen, Tsuetate Onsen in Oguni village, has been in use for an impressive 1,700 years. 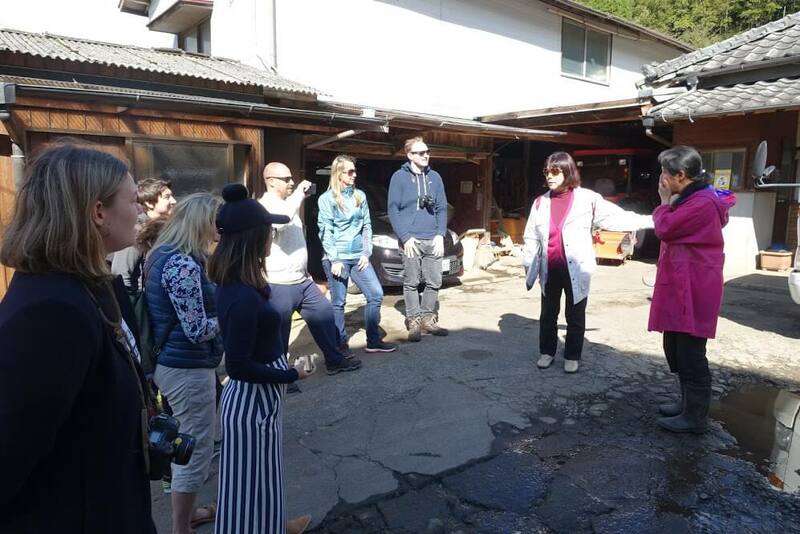 It should be noted that Kumamoto was struck by a particularly devastating earthquake in April 2016. 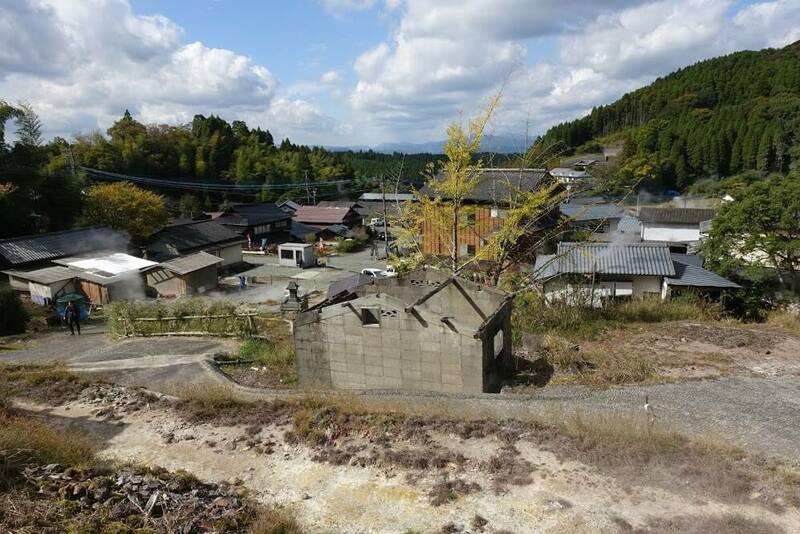 As such, many towns, villages and historical sites such as Aso Shrine are currently being renovated. 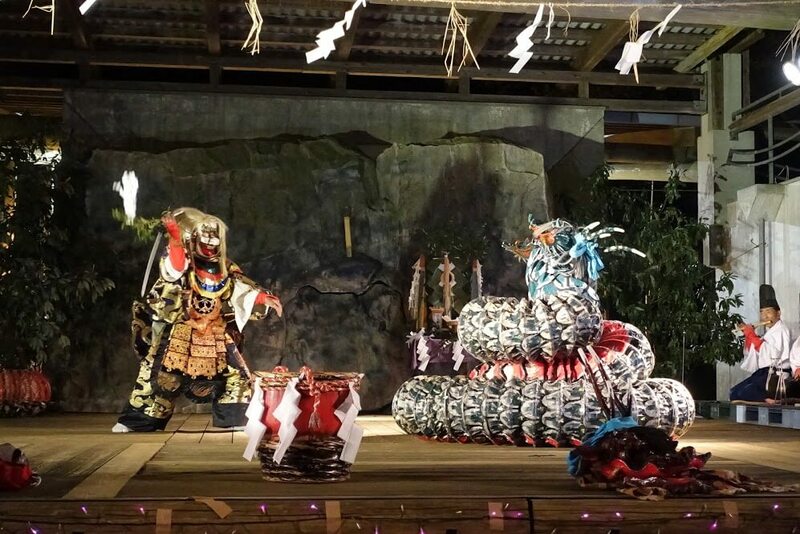 Nevertheless, the resilient people of Kumamoto and Aso eagerly await your visit to the heartland of Kyushu. 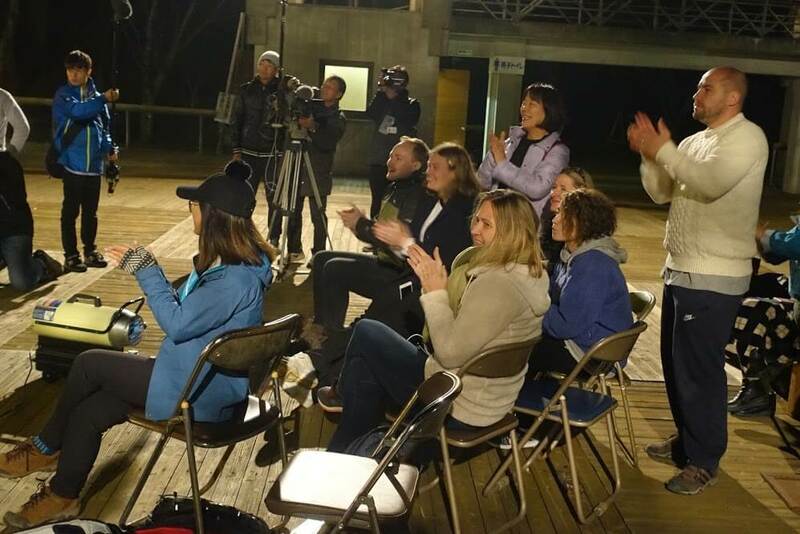 The tour will start at Hiroshima Station – meet in front of shinkansen (bullet train) ticket barrier on the 2nd floor – where the group will take a shinkansen to Kumamoto Station. 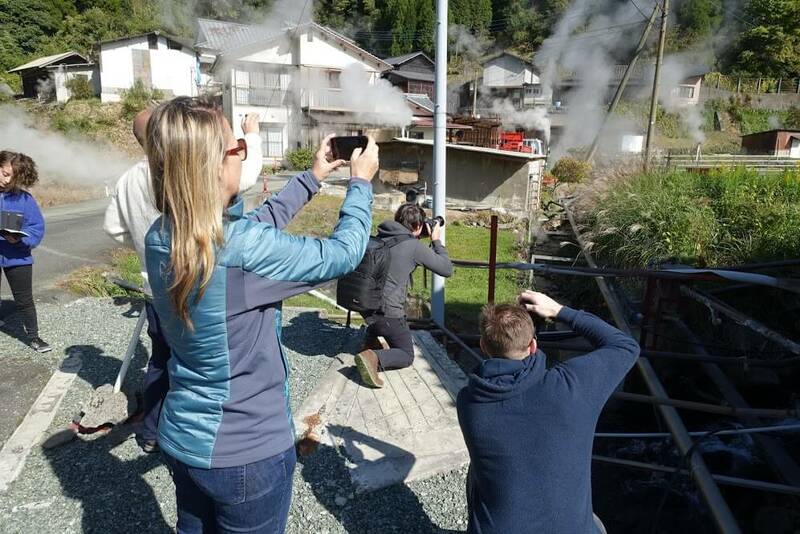 From Kumamoto Station we will board a shuttle bus bound for Aso City, located 90 minutes away. En-route you will walk Futaenotouge Pass, an elevated mountain pass 683 meters (2240.81 feet) high. 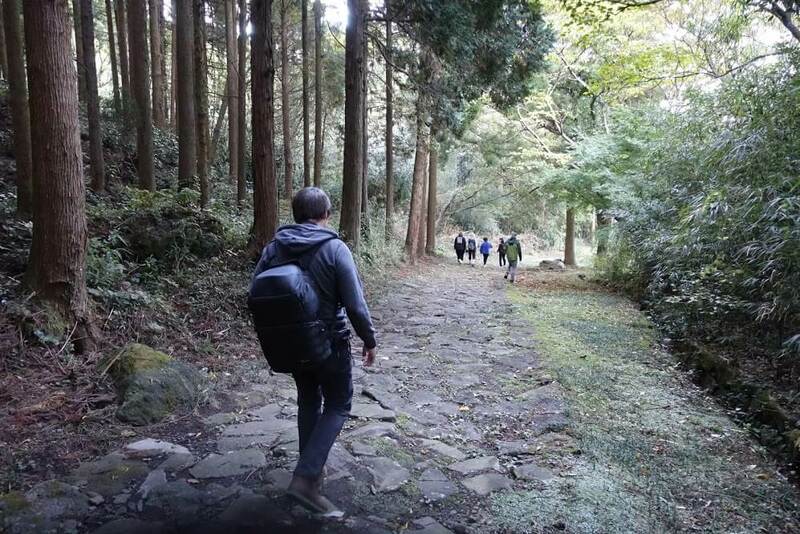 Futaenotouge Pass is a portion of the Bungo Circuit, a historic trail used by the feudal lords of the Kumamoto Domain to travel to Tokyo, in a practice known as sankin-kotai*. 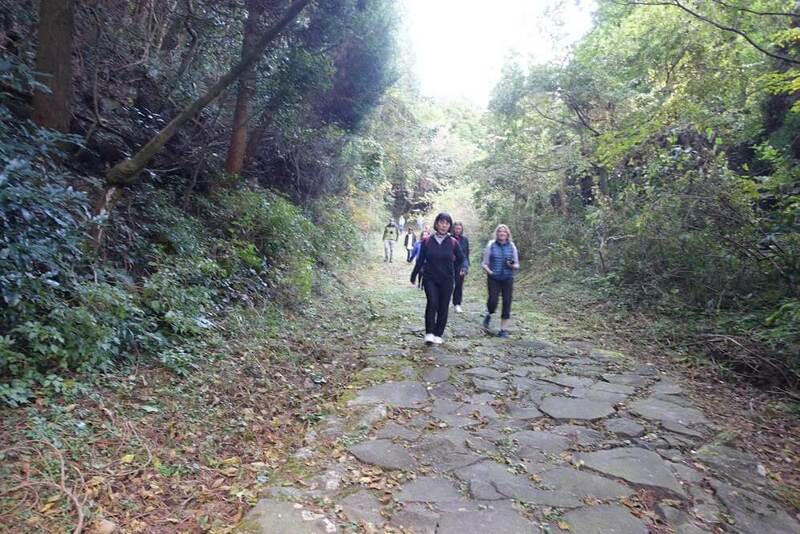 Relive history and walk in the footsteps of samurai as you trek the 1.6 kilometer (1 mile) long stone paved “Ishi-datami no Michi”, the longest of its kind in Japan. 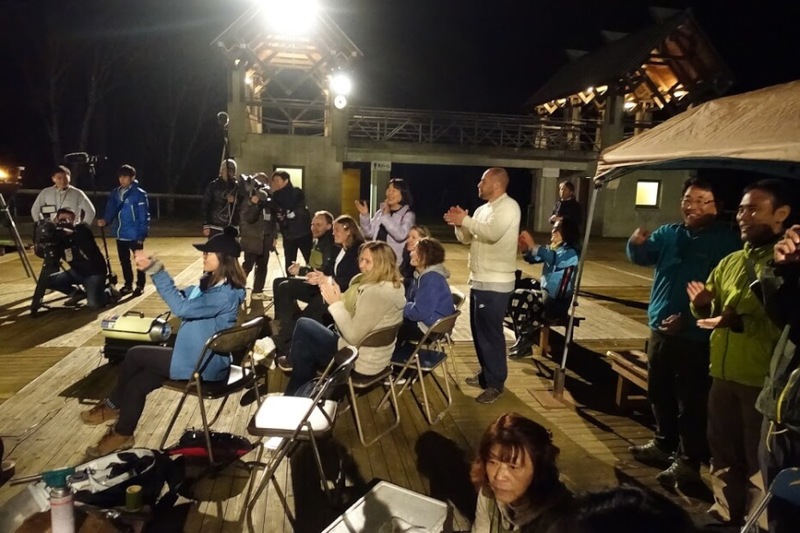 Afterwards, all tour participants will gather for a lively dinner. *Sankin-kōtai was a policy of the feudal Japanese military government that ruled from 1600 to 1868. 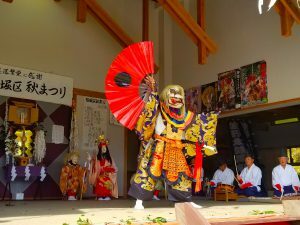 Every April, daimyō, or feudal lords, transferred between the capital Edo (modern day Tokyo) and their ruling domain, typically spending alternate years in each place. The journey to Edo was known as sankin and the return trip known as koutai. Total walking: 1.6km (1 mile) / 1 hour. Total elevation gain: 250m (820ft). 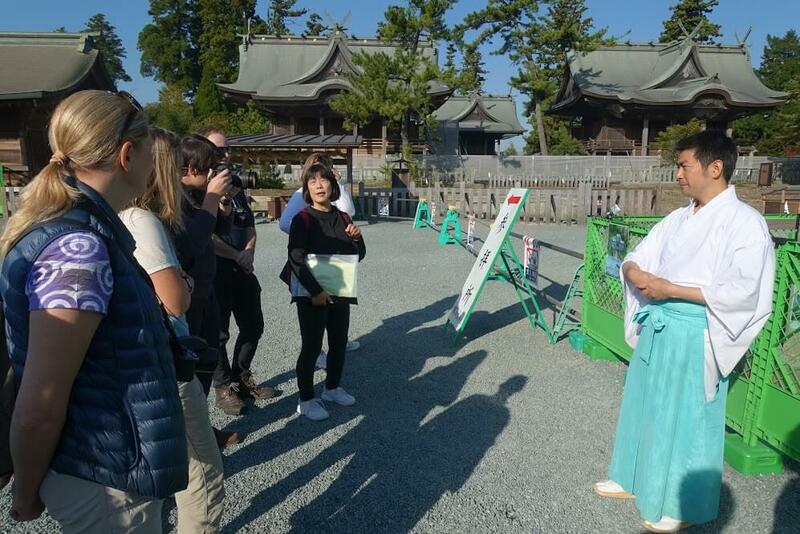 After breakfast, we will depart for Aso Shrine. Along the way, we will stop at the former girls school which was built in the early 20th century. 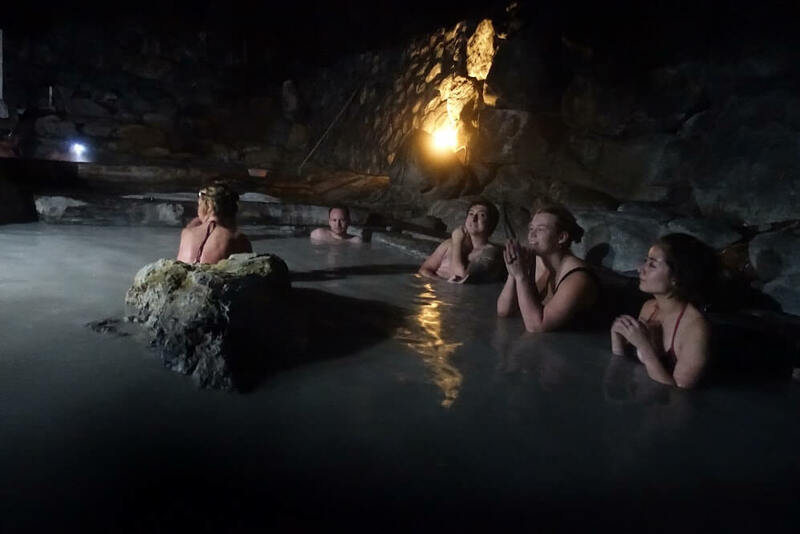 The charm of this old building is accented by the sounds of bubbling water on the premises due to the large presence of spring water in the area. Lining the sando (the procession to Aso Shrine) are plenty of unique shops that offer an impressive variety of souvenirs and delicious Japanese foods. 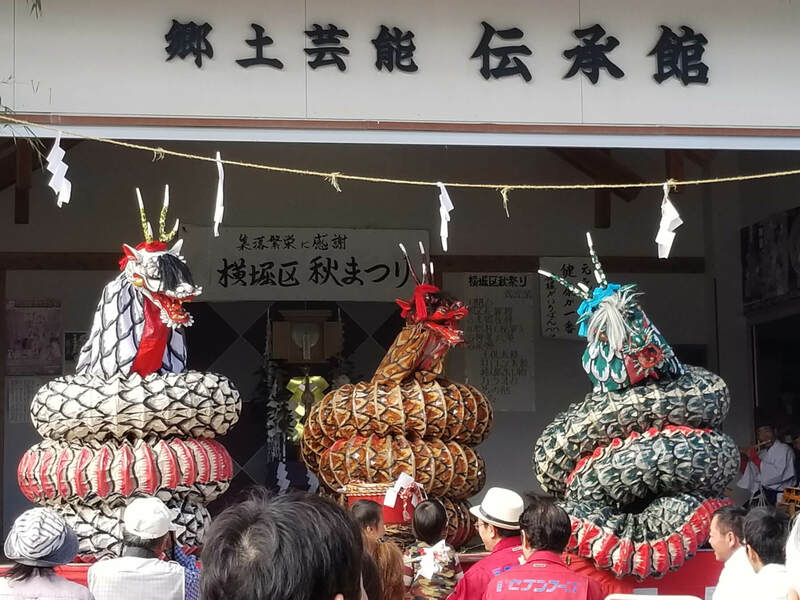 Afterwards, we will make our way to Kokuzo Shrine, marked by its impressive shinboku, a divine tree in which kami (spirits and deities) reside. 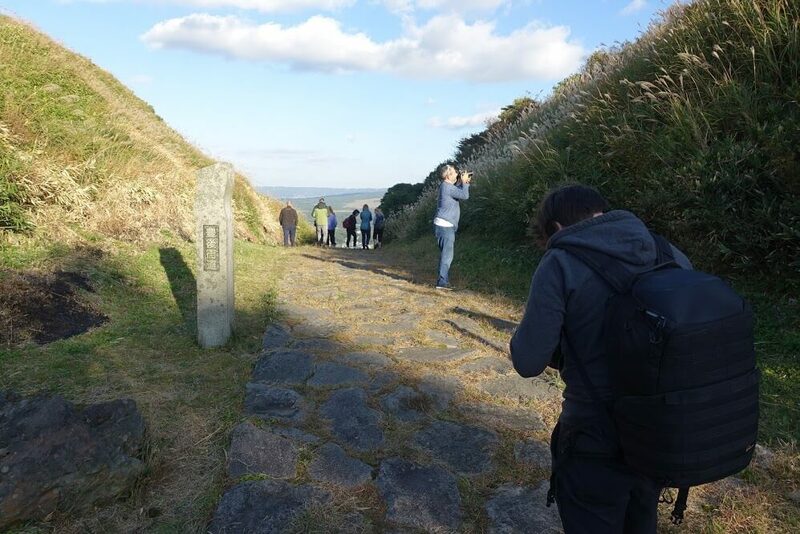 We will also visit the 6th century kofun (megalithic tombs) of Kami-Mikura and Shimo-Mikura. 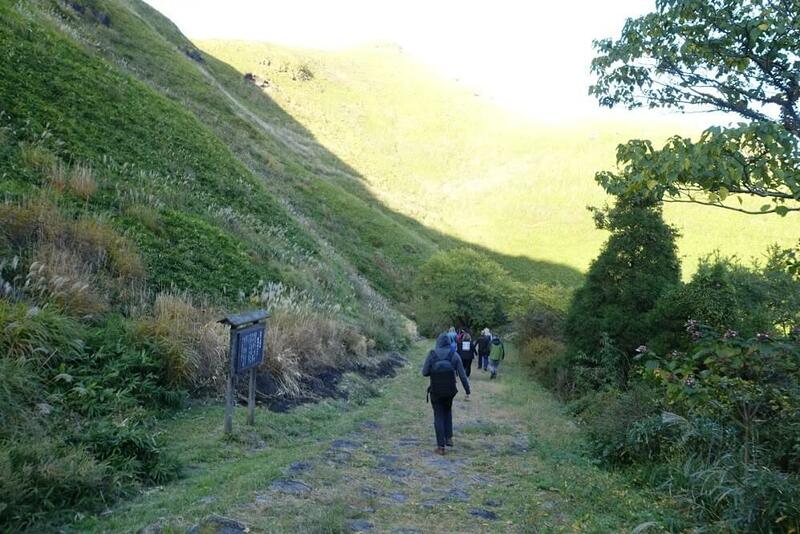 Lunch will be at a local eatery, and is followed by an afternoon trek of Mount Kishima, one of Mount Aso’s Five Peaks. Its summit and eastern side are marked with three craters. 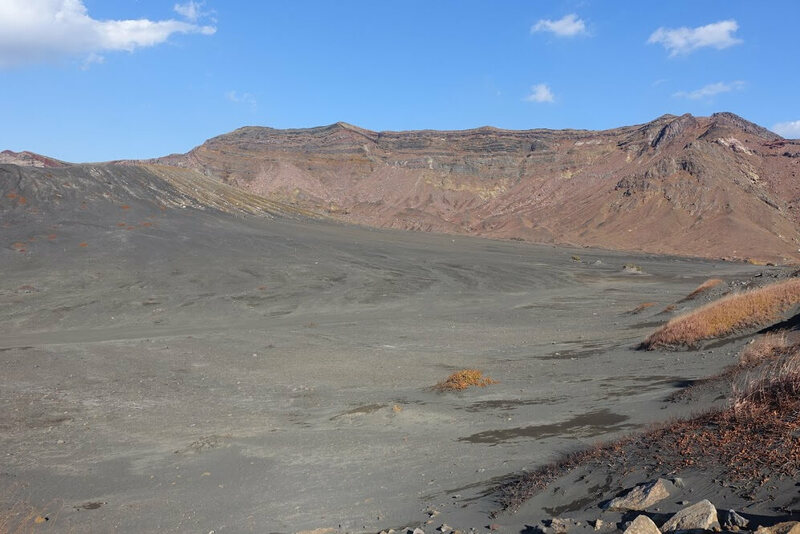 Take in the unobstructed views of the caldera’s cone from the northwestern side. Dinner and lodging will be at a local establishment. Total walking: 6km (3.7 miles) / 2.5 hours. Total elevation gain: 180m (590ft). 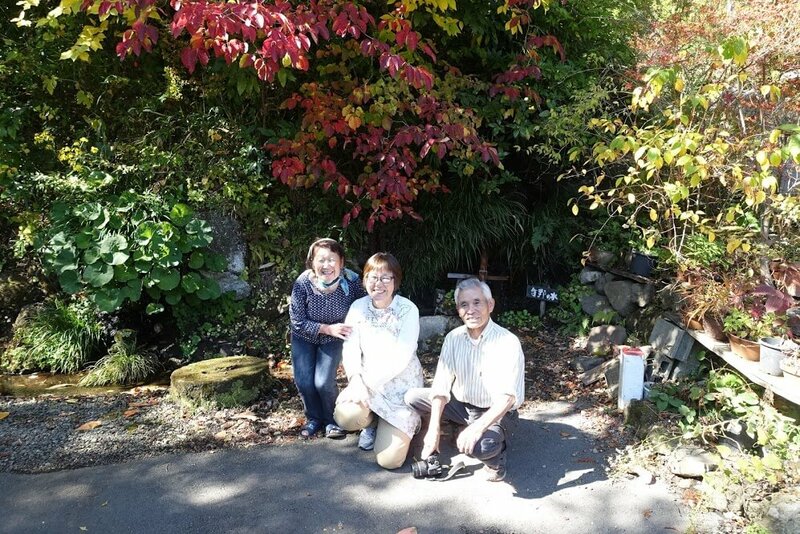 On this day, we will walk from Nishinomiya Shrine to Minamiaso Village and Yasaka Shrine. Note how the stone staircase of Yakasa Shrine and its torii, or gateway, are joined by the Megane Bridge, a famous arched stone bridge. 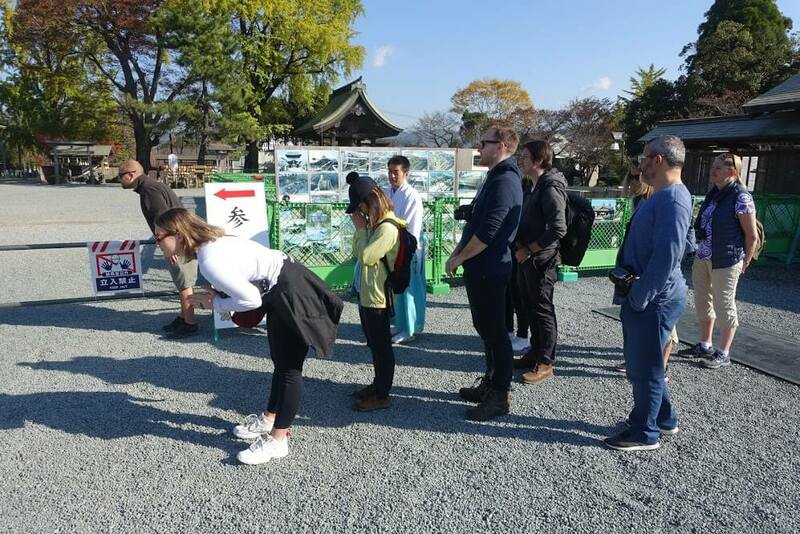 From Yasaka Shrine, we will venture in the direction of Nishinomiya Shrine for a 90 minute walk. Among the kami worshiped at Nishinomiya Shrine are the daimyojin, “great shining deities,” of Aso, Kosa, and Takaki. 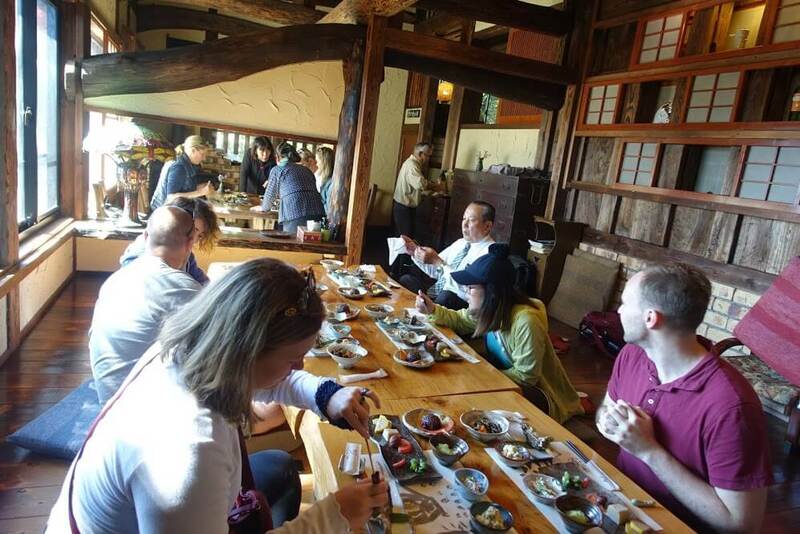 Lunch will be at a soba restaurant in Minamiaso Village, followed by a tour of nearby Takamori. 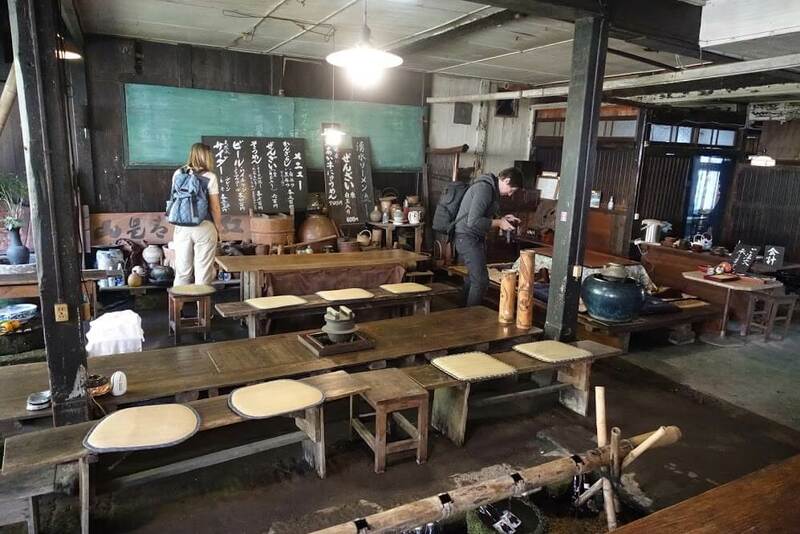 First we will visit Hizenya, a craft shop famous for producing Marukichi Soy Sauce and miso. 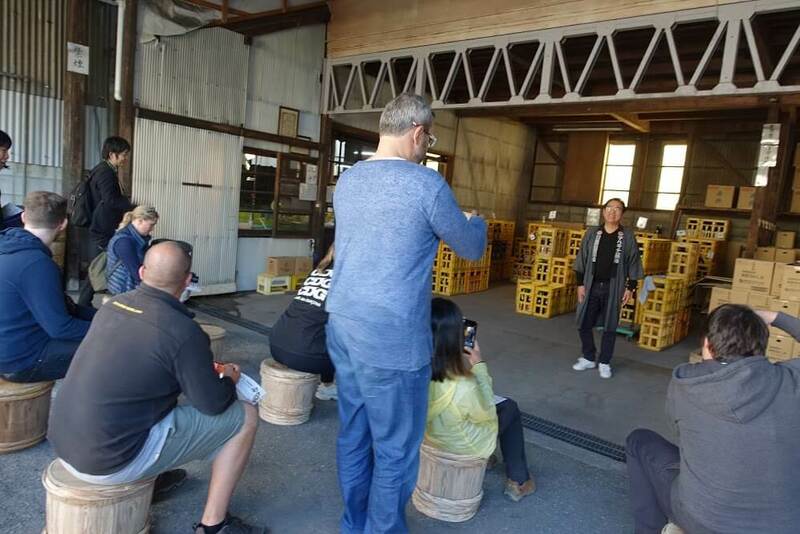 Our next stop in Takamori is a sampling tour at Reizan, an iconic sake (rice wine) maker in Kumamoto. Dinner and lodging will be at a local establishment. 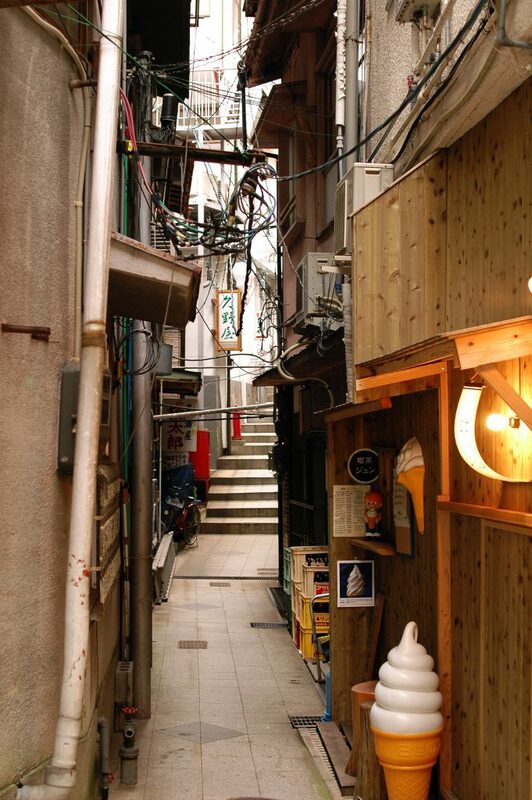 Accommodation: Japanese inn / Hotel / B&B. Total walking: 7.5km (4.7 miles) / 1.5 hours. 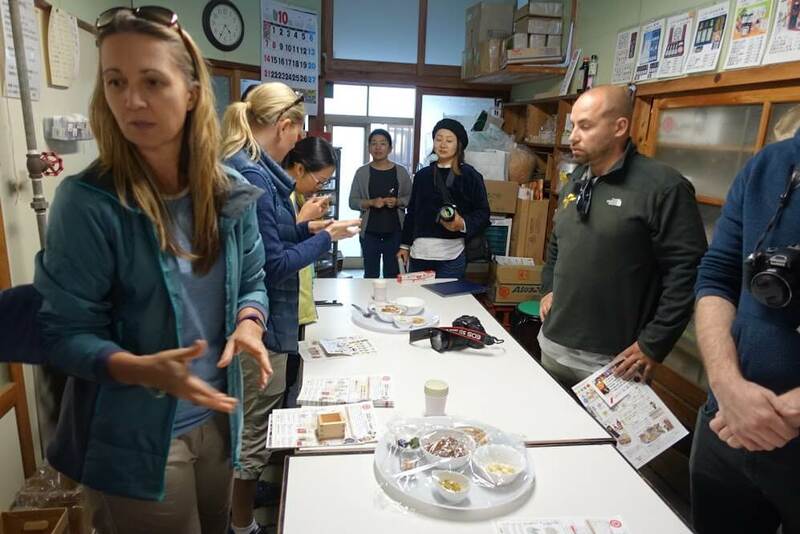 After breakfast, we will venture out to Ubuyama, a village located in the northeast portion of the Aso caldera. 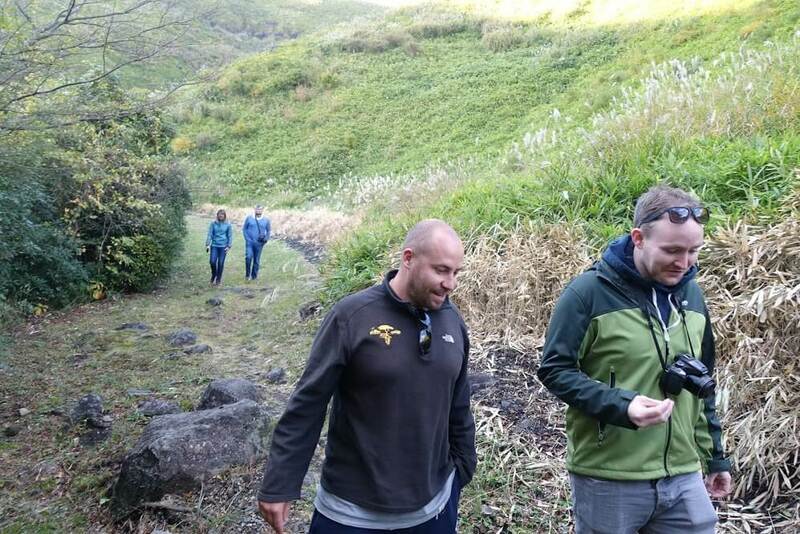 Our first stop is Higotai Park, famed for its collection of flowers, especially its higotai (echinop setiferus) that bloom in summer. 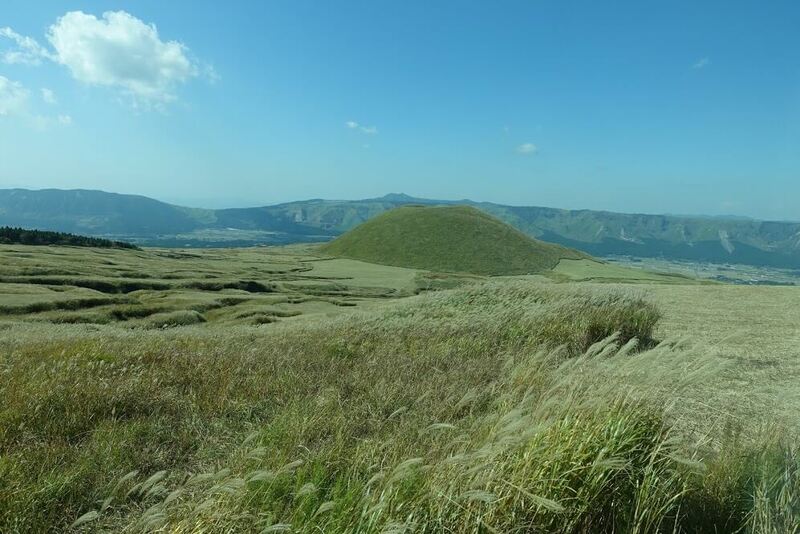 From Higotai Park we will walk to Ougida, a picturesque rice terrace highly esteemed in Japan. 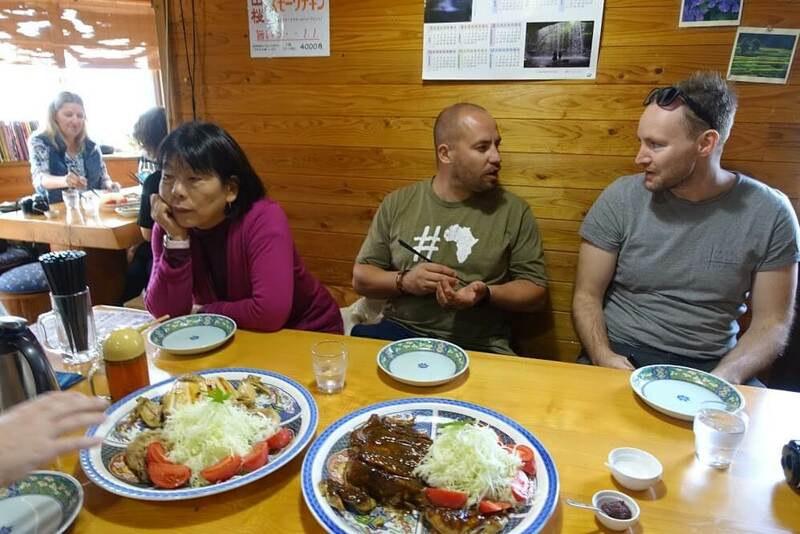 Once you have eaten lunch, we will continue to explore Ubuyama’s natural attractions, one of which is the Ikeyama Fountainhead. 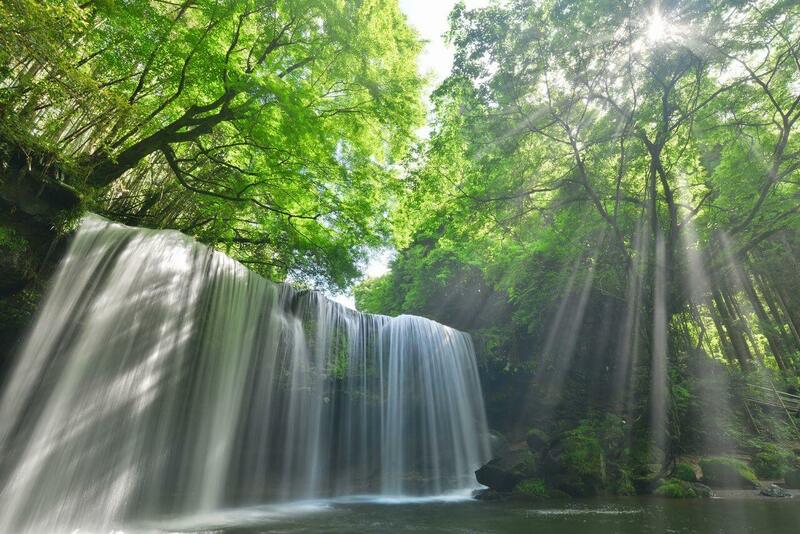 Ikeyama Fountainhead has been chosen by the Japanese Environment Agency as one of the 100 exquisite and well-maintained waters in Japan. 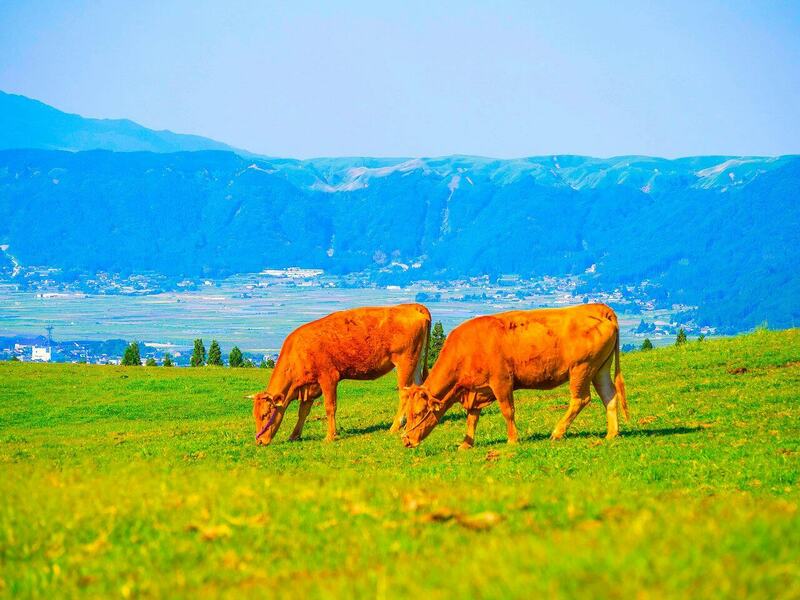 From Ikeyama Fountainhead we will trek to Ikeyama Farm, home of aka ushi, or Japanese Brown cow, a breed of small wagyu beef cattle known for its red coloring and tenderness despite its lack of excess fat. There will be ample opportunity to learn more about the breed at the farm. 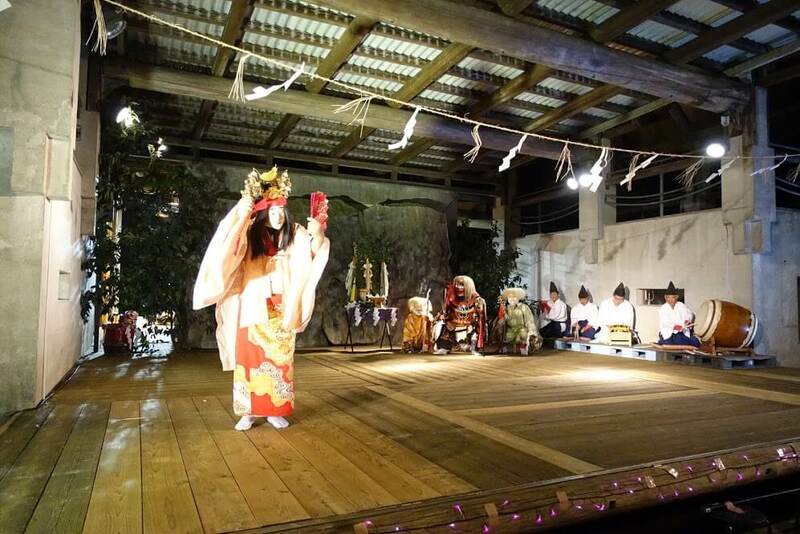 Afterwards, enjoy a performance of kagura at Namino Kaurgaen. 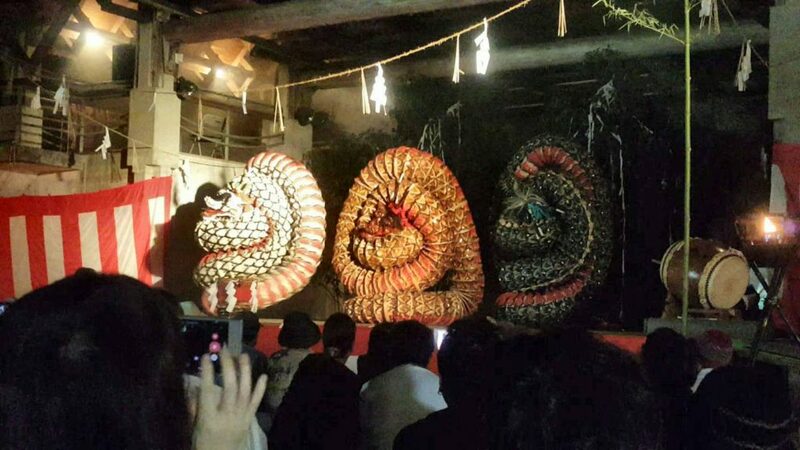 Kagura is the oldest performance art of Japan that vibrantly depict tales of Japanese mythology. 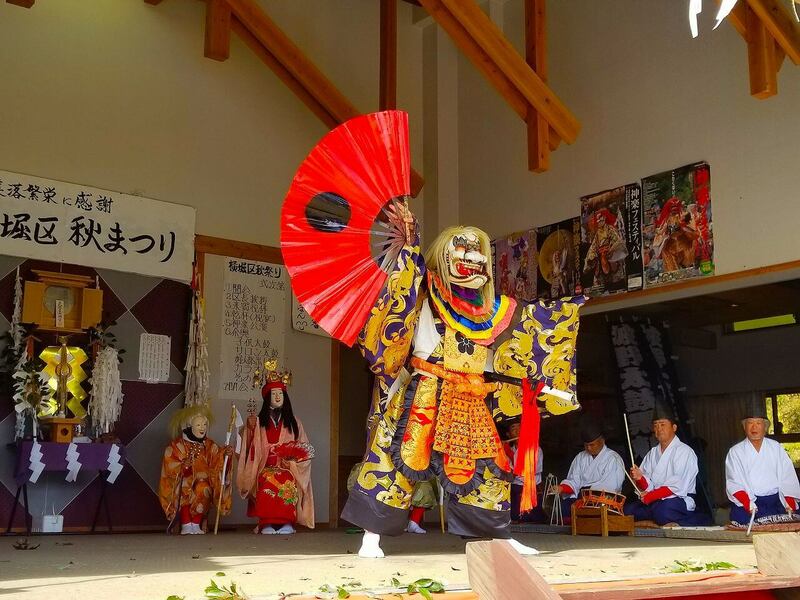 You may also explore the kagura-dono, the building within a Shinto shrine where kagura is performed for kami (deities) during ceremonies. 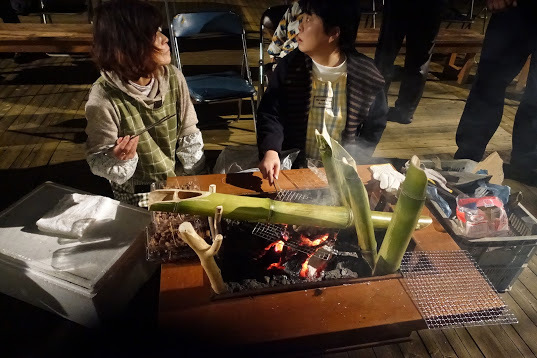 Following the kagura performance, we will dine and rest at a local establishment. Total walking: 6km (3.7 miles) / 2 hours. 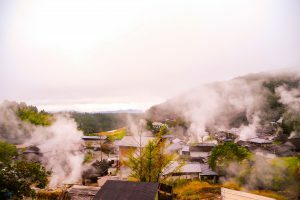 On this day, you will be able to experience the relaxing Japanese custom of bathing in a hot spring, or onsen. 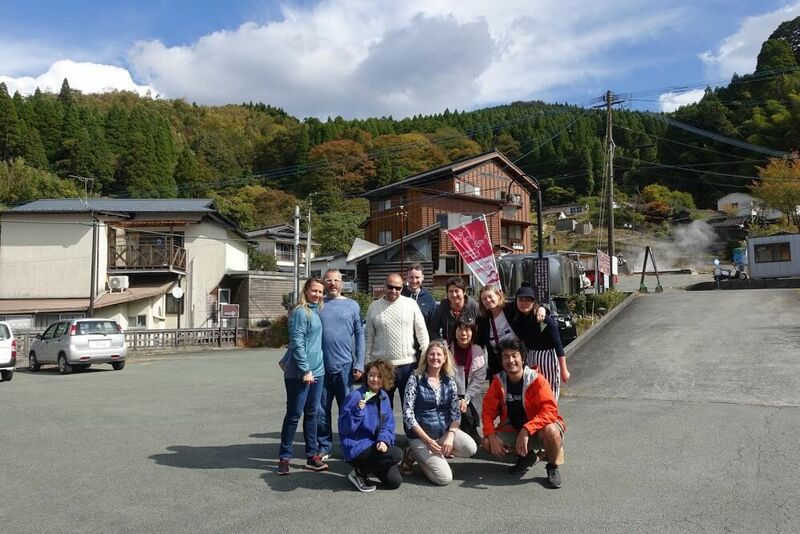 After breakfast, we will head to Tsuetate Onsen town, located in the mountains that straddles Kumamoto and Oita Prefectures. 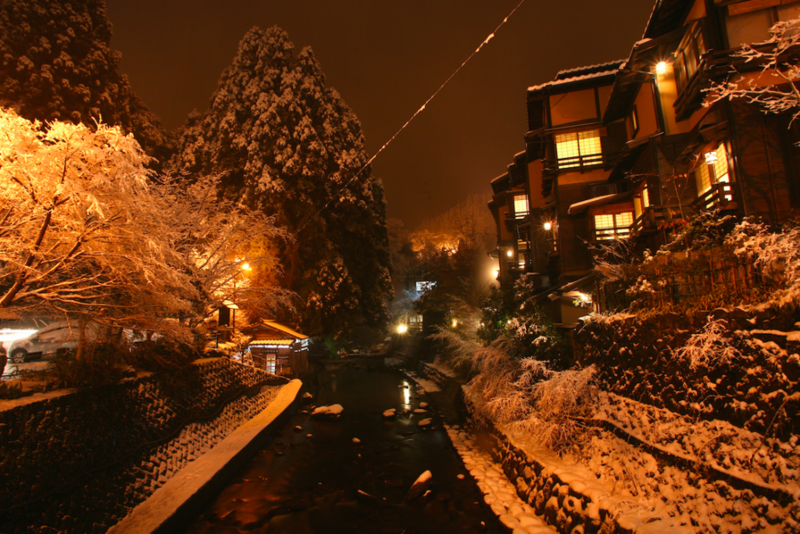 Steam dances around the Japanese inns and shops and the murmuring of its namesake, the Tsuetate River, adds to the appeal of this attractive onsen town. 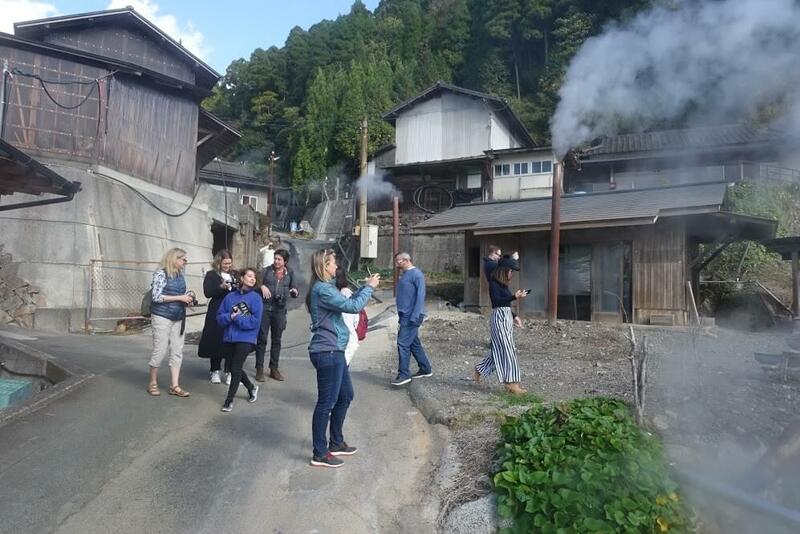 Afterwards, we will head to Waita Onsen village, with its collection of 6 hot springs located at the base of the 1,500 meter tall Mount Waita, overlooking Kumamoto and Oita Prefectures. 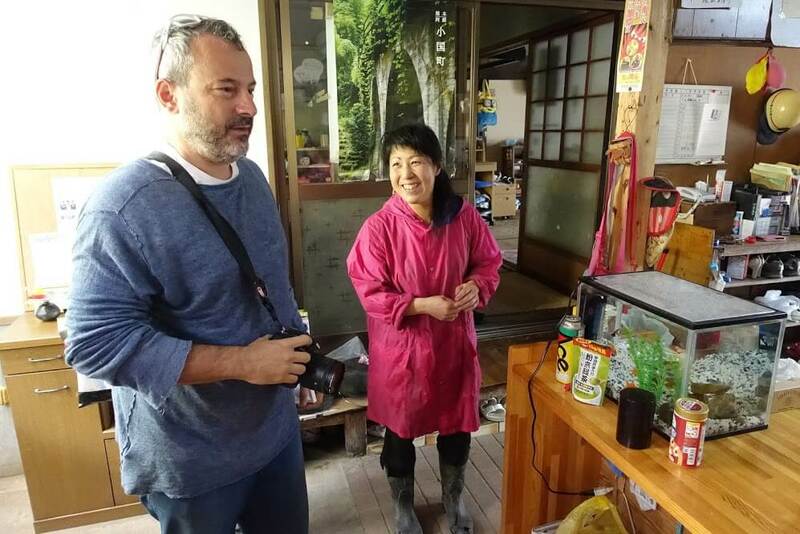 A visit to the town of Oguni, its Horai Yoshimi Shrine and a trek to Nabegataki Falls follows lunch. 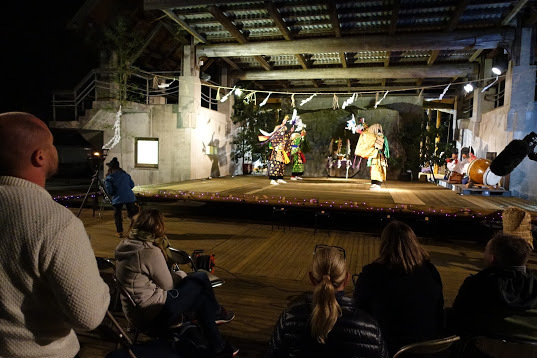 Horai Yoshimi Shrine is distinguished by its 700 year old towering twin cedars while Nabegataki Falls boasts a 20 meter (feet) wide curtain of cascading water with an accessible spacious area behind the falls. 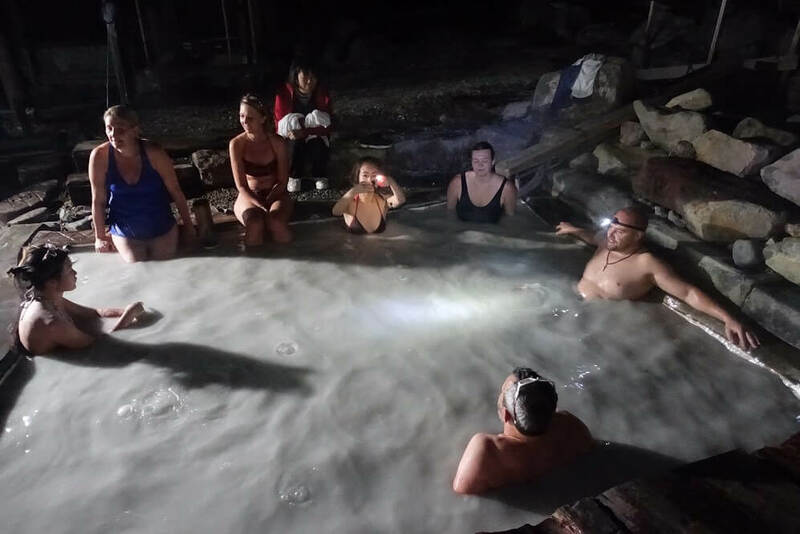 The final hot spring of the day is Kurokawa Onsen, a village with an assortment of some 25 different hot springs and outdoor baths that attract visitors from all over Japan seeking relaxation. 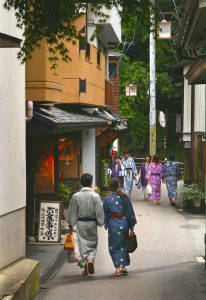 Food stands, Japanese inns and souvenir shops line the streets, creating a charming atmosphere that is the perfect escape from urban life. 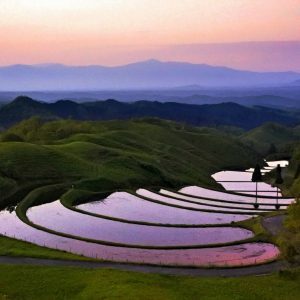 After dinner, we will board a minibus bound for Hirano-Dai, also known as Lover’s Hill, to take in the starry skies and beautiful panoramic views of Aso caldera. 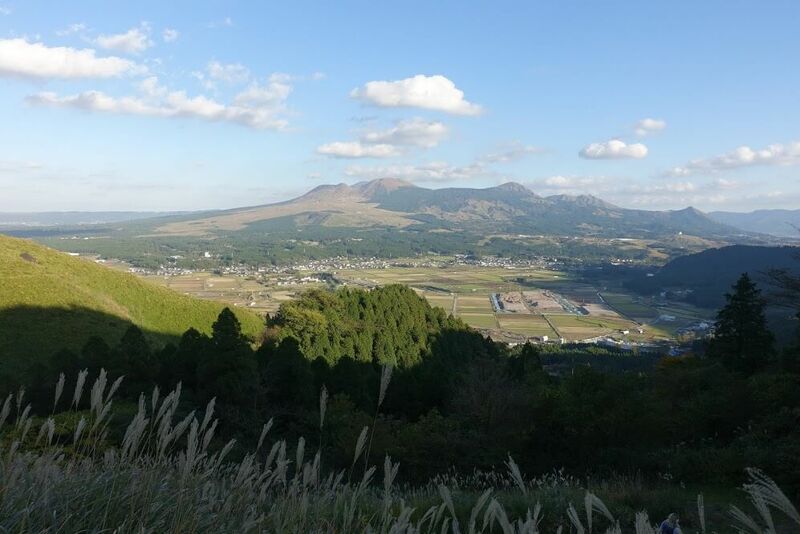 To the east of Lover’s Hill is the Kuju Mountains; to its south is Minamiaso. 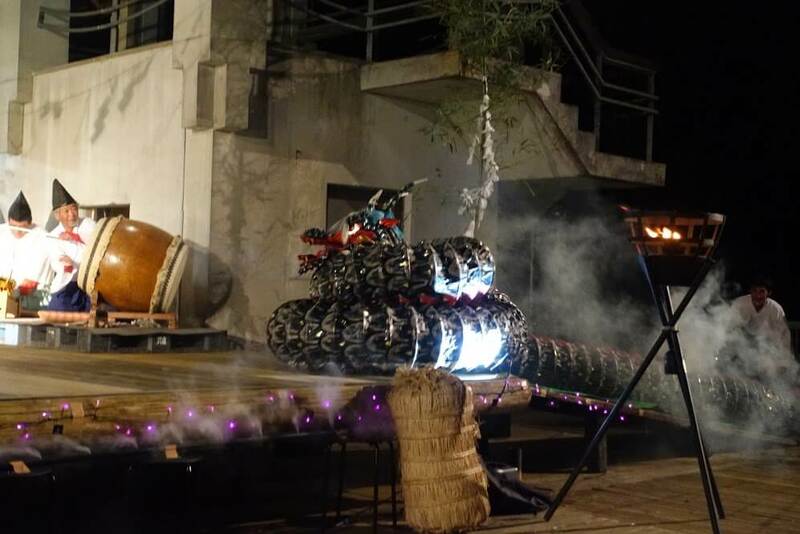 We will return to our lodging to close the night. Total walking: 8km (5 miles) / 3 hours. The Aso tour concludes after breakfast. 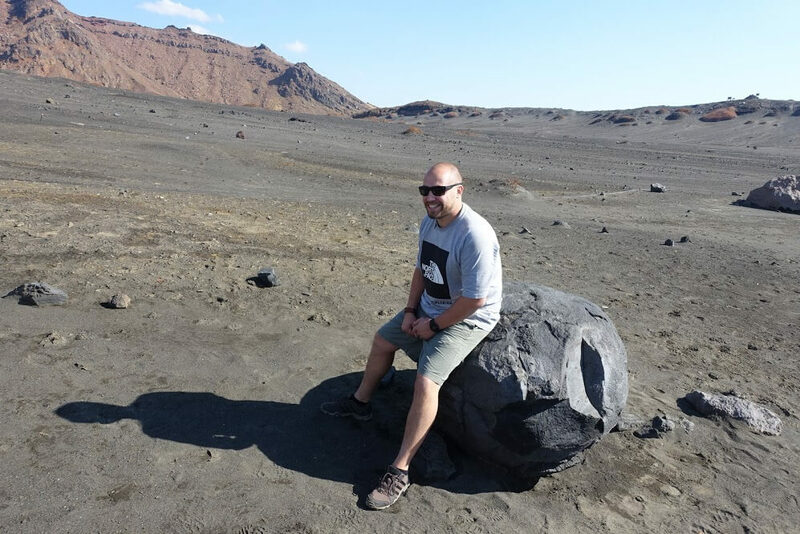 Your tour leader will be able to assist you in purchasing tickets as well as directing you to your next destination with ease. 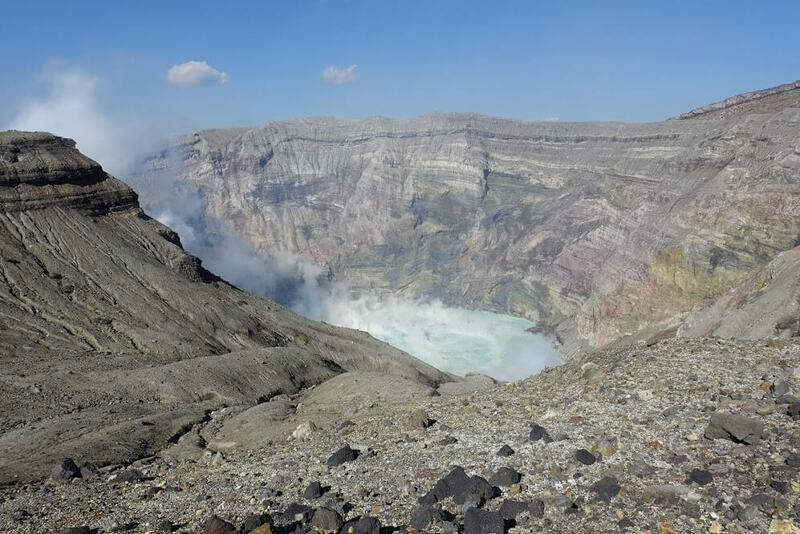 The caldera of Mount Aso is one of the world’s largest volcanoes. 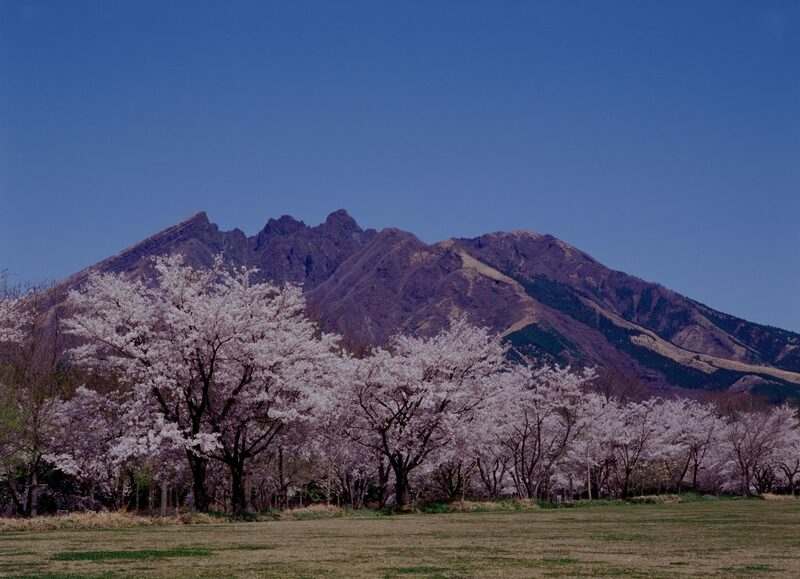 “Aso” refers not only to the city, but also Mount Aso. 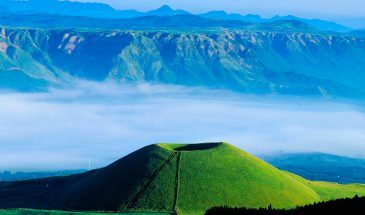 Mount Aso is not a singular mountain; rather it is geologically classified as a cluster of volcanic peaks that form a ring around the city. 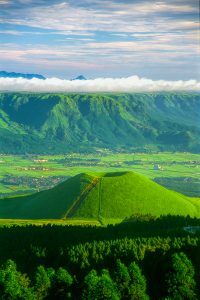 Oguni lies in the northern portion of the outer mountains of Mount Aso. 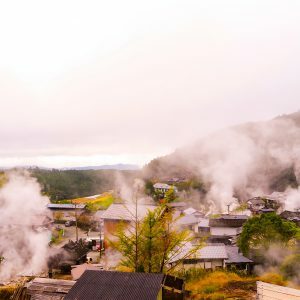 Within this area of forested mountains and fields is Tsuetate Onsen hot springs, a charming onsen (hot spring) town that rests quietly within the rising steam from the underground sources, as well as Waita Onsen and Kurokawa Onsen. 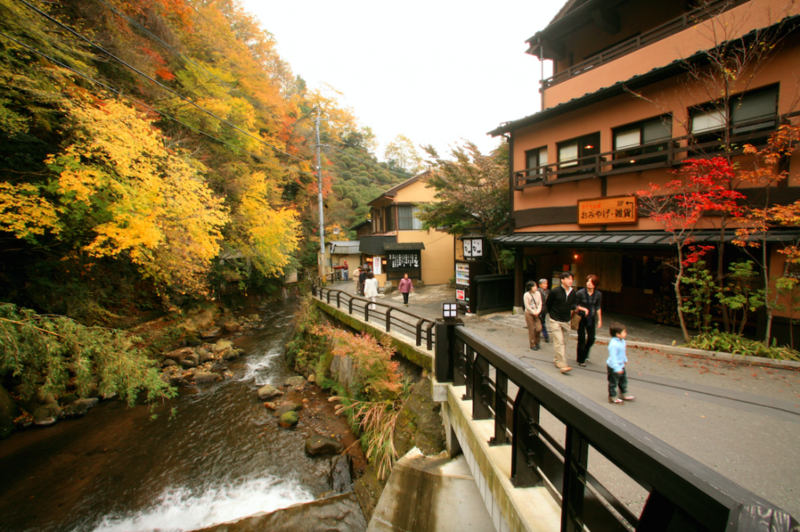 Minami Oguni Village is prized as one of Japans 100 most beautiful villages. 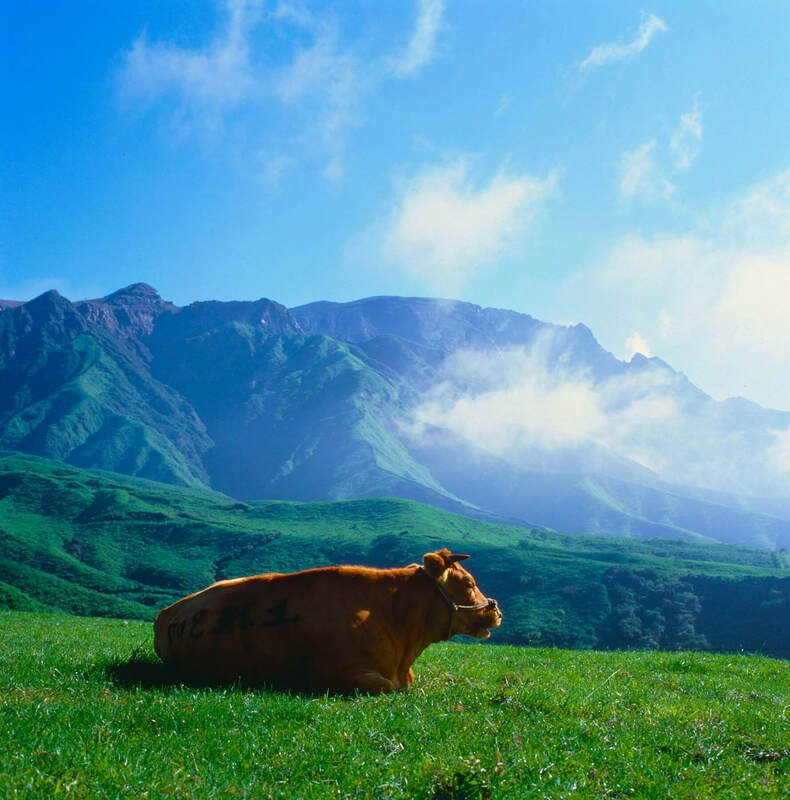 In the northeast of Mount Aso’s outer ring of mountains and encircled by the Kuju Mountain Range lies Ubuyama Village. 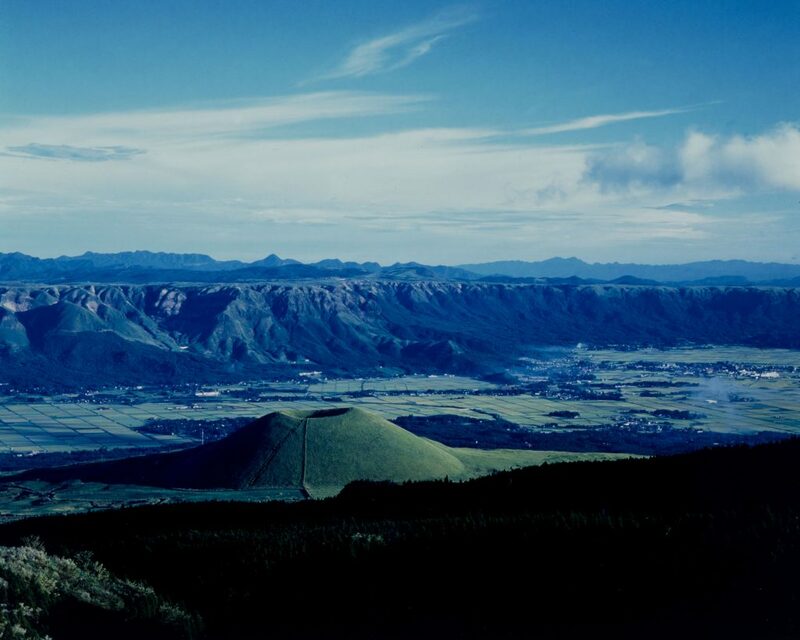 Ubunyama village is a land of sprawling grasslands, lush green forests and limpid waters. 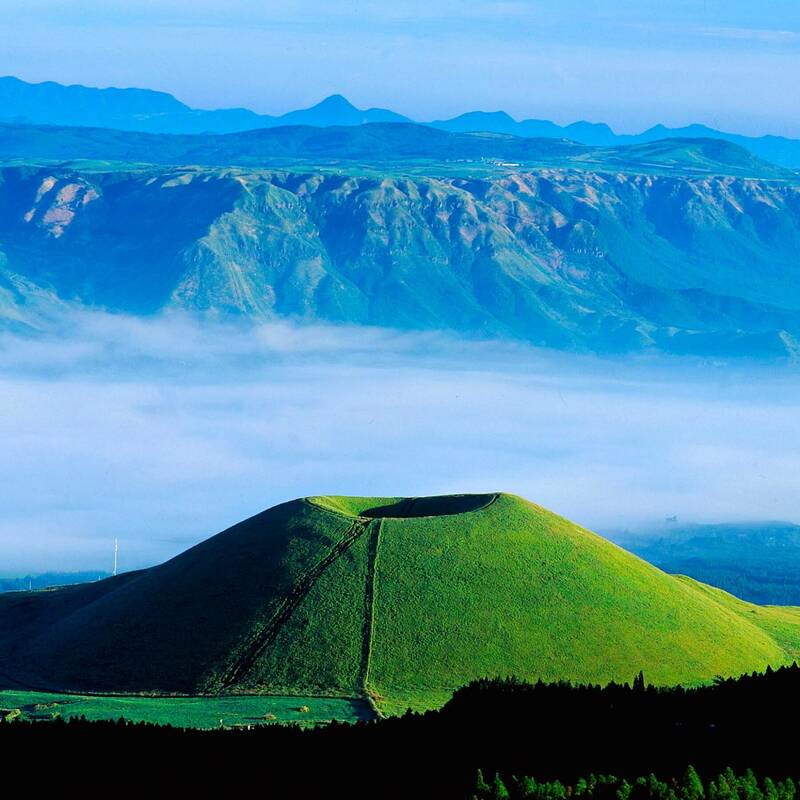 From its highlands one is greeted to a 360 degree panoramic view of Mount Aso, Mount Kuju and Mount Sobo. 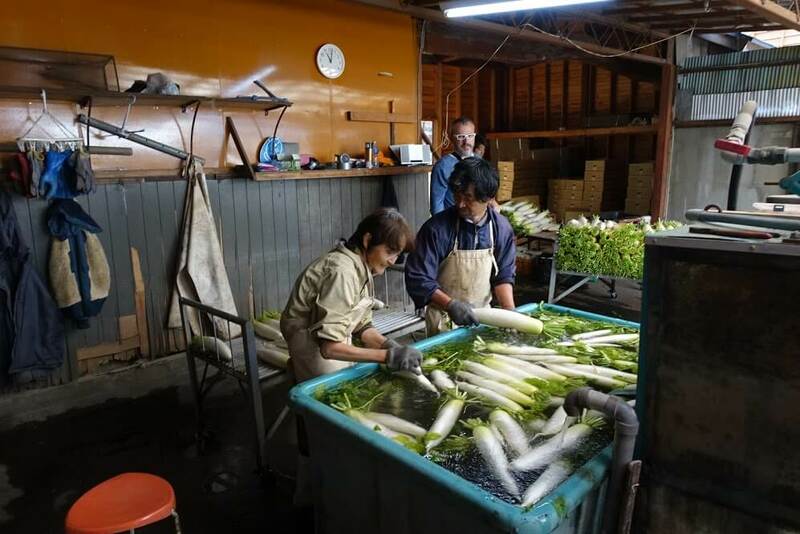 Here, one can enjoy the spoils of nature that are seldom discovered amongst urban life, making Ubuyama the perfect nature retreat to experience scenery characteristic to each season, life on a farm, fresh water, and delicious foods. 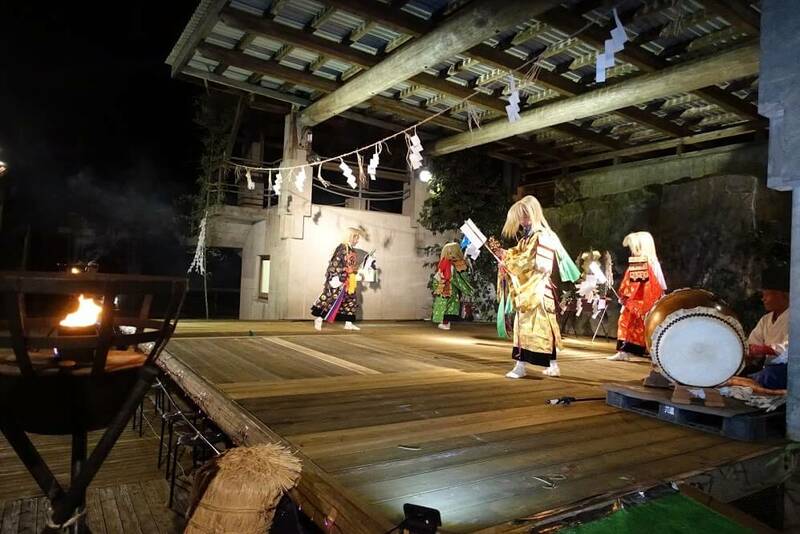 Namino village lies in the northeast of Kumamoto Prefecture, bordering with Oita Prefecture. 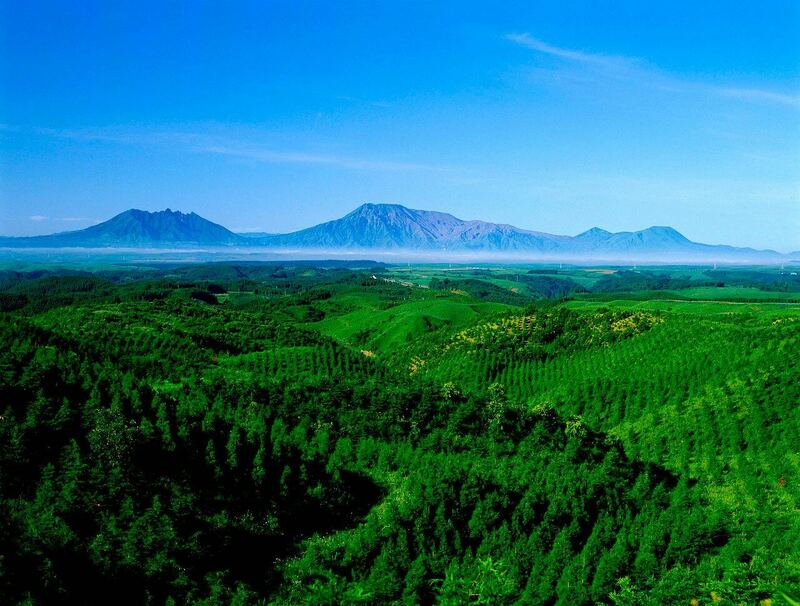 Namino is enveloped by mountains and is rich in natural resources. 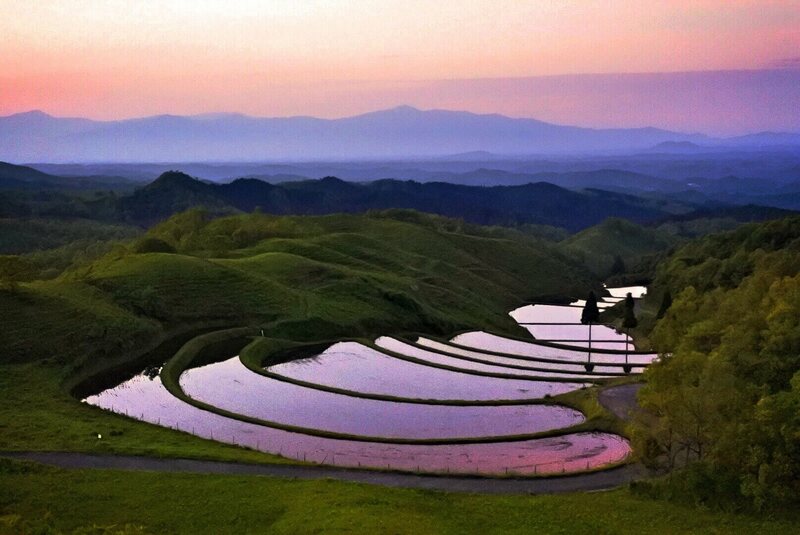 In Japanese “nami” means “waves”, and as such Namino takes in name from the fact that this outer rim of Aso resembles waves. 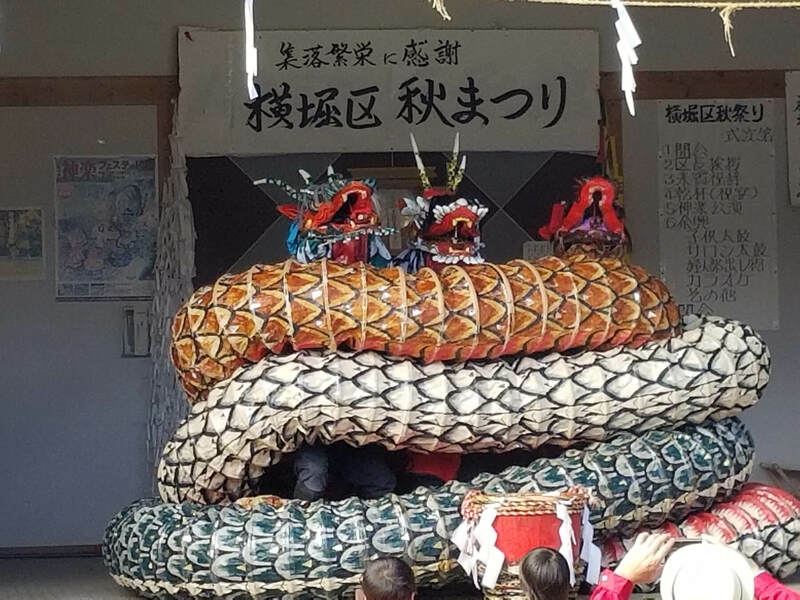 Namino is also known for Nakae Iwato Kagura and Yokobori Iwato Kagura. 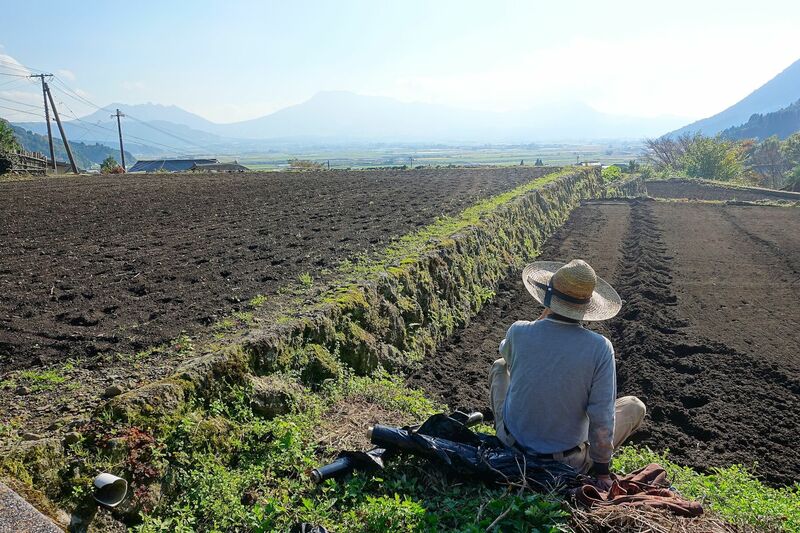 The district of Teno, a farming village tucked beneath abundant nature, is more than 2,000 years old. 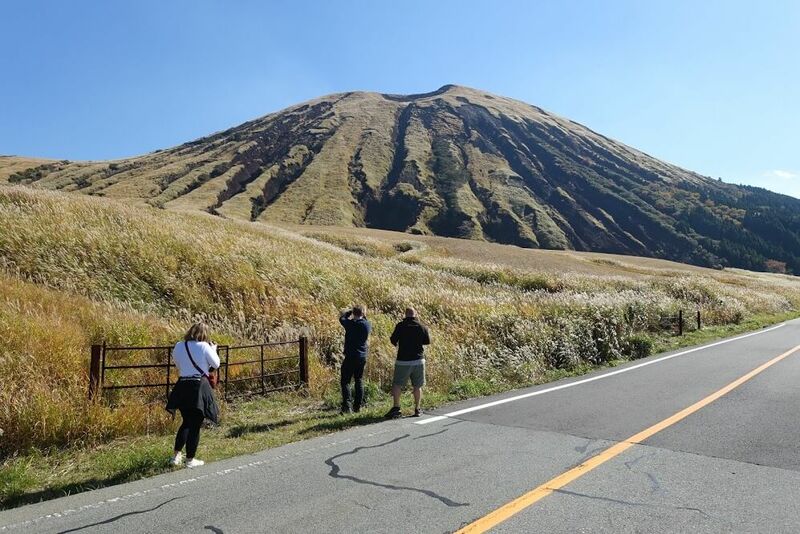 It is where one can take in all 5 peaks of Mount Aso and be captivated by its waterways and greenery. 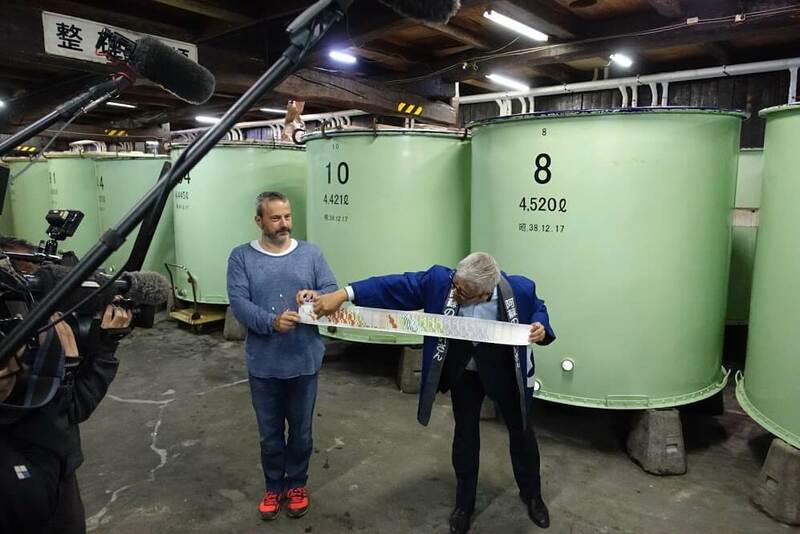 It is renowned for its spring water known as Teno no Meisui. 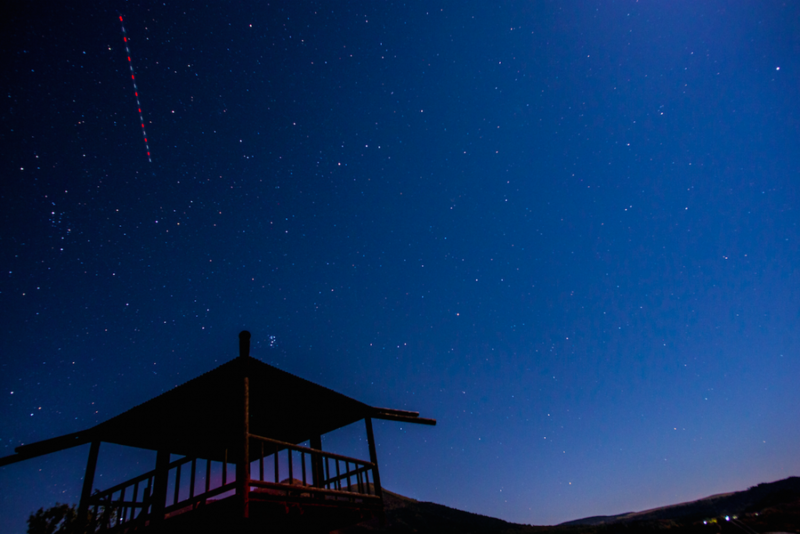 Teno is also home to Kokuzo Shrine, affectionately dubbed the sibling to Aso Shrine. 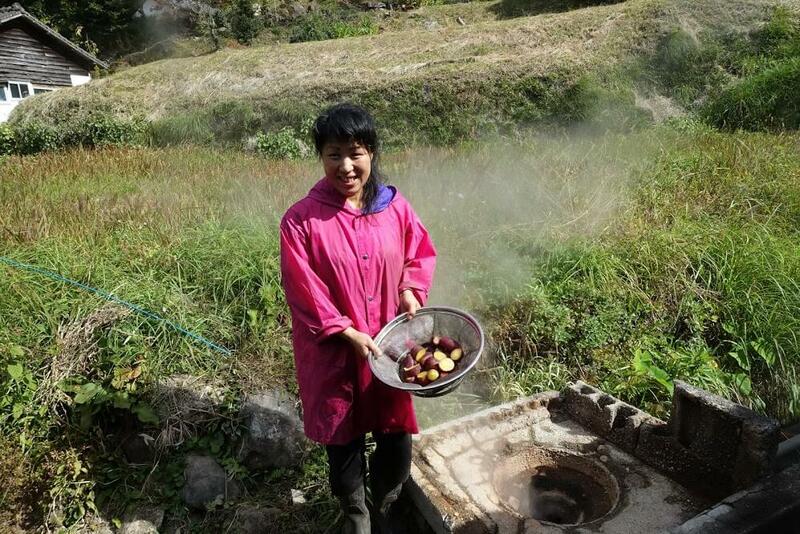 A common sight in Teno are gardens in which bamboo baskets full of taro potatoes swish around in miniature waterfalls created by a small flowing stream. 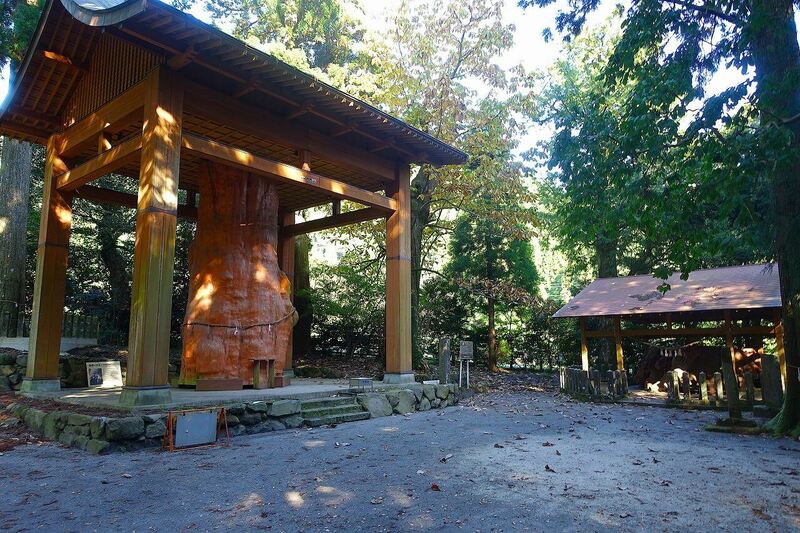 Aso Shrine is one of Japans oldest Shinto shrines. It is famous not only for the gods that is enshrines, but also for the road that leads toward it. 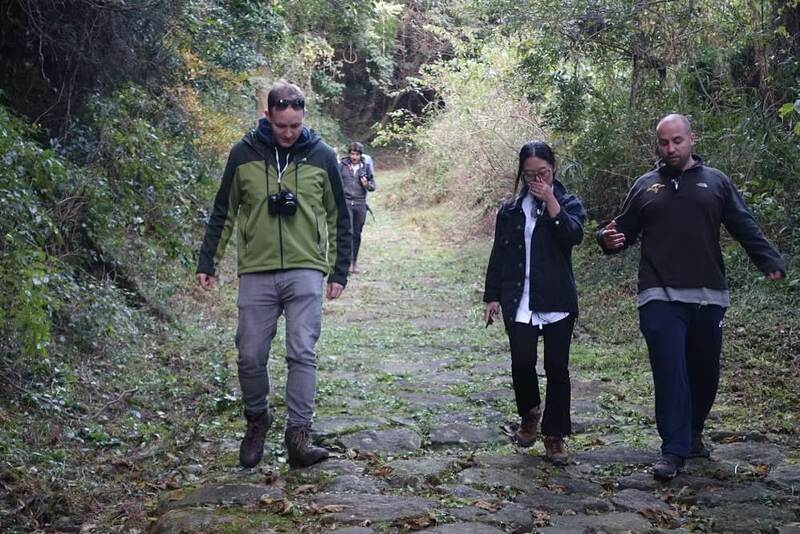 This path is popular among pilgrims and nature lovers alike. 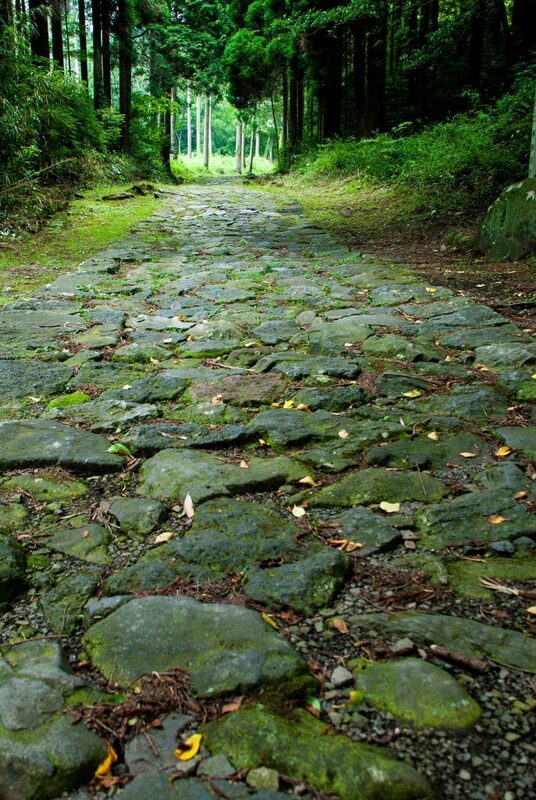 The sando, or pilgrimage route leading up to Aso Shrine, is a rarity as it runs parallel to the Shrine instead of leading directly to it. 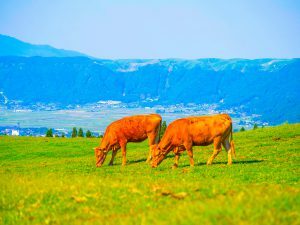 Kumamoto aka ushi is one of the 4 breeds of wagyu, Japanese cattle or beef crossbred and cultivated in Japan since the late 19th century. 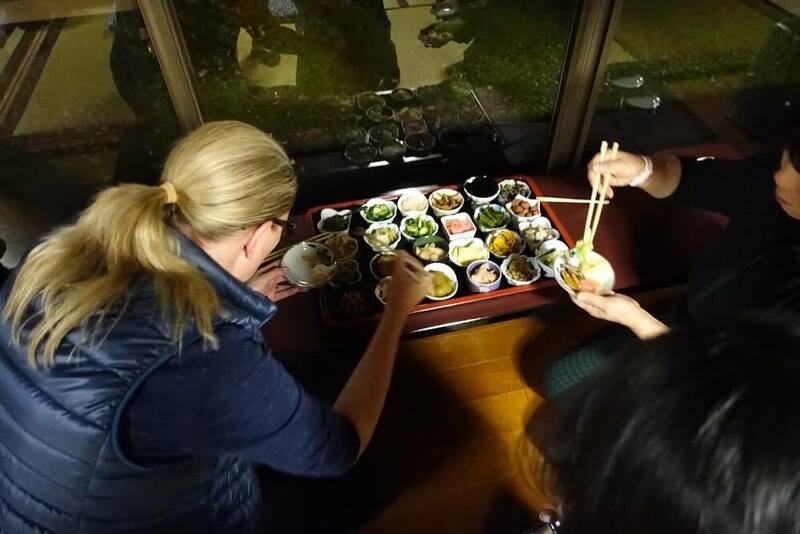 Heartland Japan delivers on its promise to give you a personalized authentic Japanese experience taking care of all the logistics so you can enjoy the hidden gems of Japan that people rarely get to see. 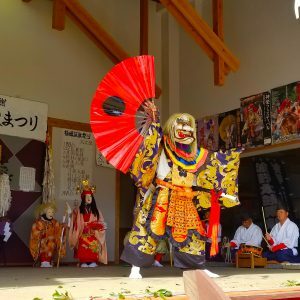 So much of Japan is left undiscovered: language, culture, food, landscape, the country is so much more than the traditional Golden Route. To see it all, and to see it well, I whole-heartedly recommend Heartland Japan. 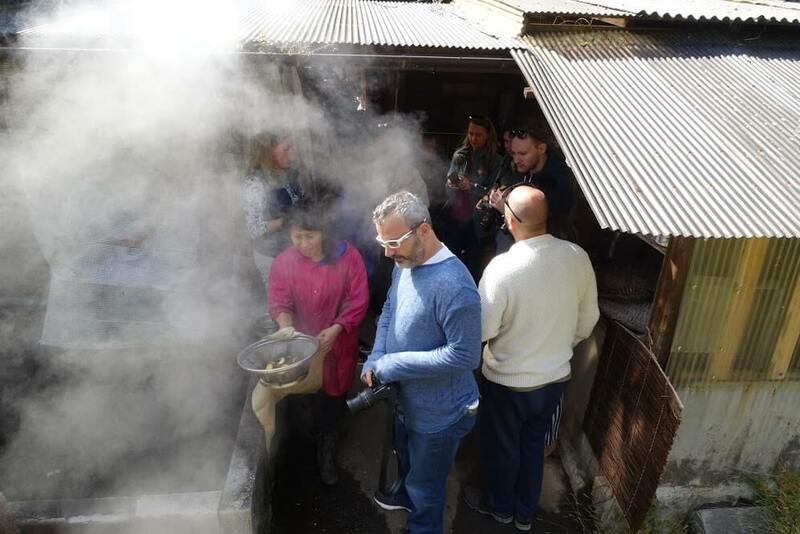 The combination of local knowledge and expertise makes the whole experience feel 100% authentic, minus the burden of having to discover it all yourself. 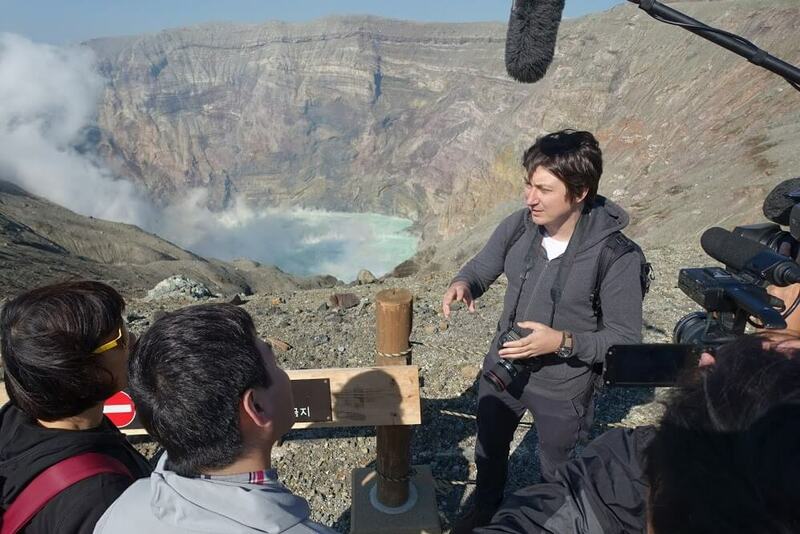 The visit to the crater was excellent, that should be a global destination rather than just one in Japan. 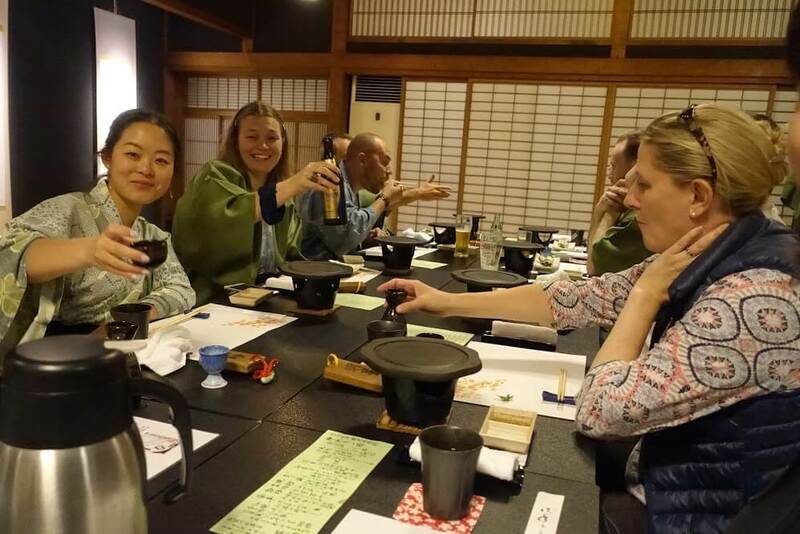 The highlight of my entire trip was the visit to Waita Onsen and the meal that was prepared there. 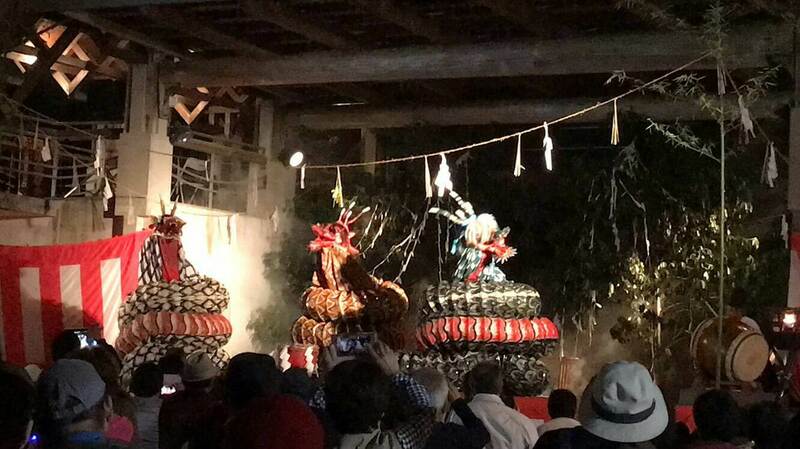 The Kagura Performance was amazing – one of the best evening experiences I’ve had in Japan.